The previous day’s account may be found here. I woke to a bright, blue, beautiful day. The wanderlust gods certainly were taunting us. I met Bruce in the lobby and we considered our options, finally settling on a fairly interesting-looking road log along Route 9. We had done part of this route earlier, but most would be new, and the new part would include much of the Guffey caldera. I reheated and ate the other half of my bagel ham and egg and cheese sandwich from the previous morning’s breakfast, and Bruce loaded up on caffeine again from the Java Moose. Then we headed south. The new part of the route began at Hartsel. From here I tried to follow along our route using the road log, but we were starting in the middle, going the wrong direction, and the log turned out to have fairly miserable maps. We finally gave up and decided to drive clear to the south end of Route 9, where the log began, and work our way back. 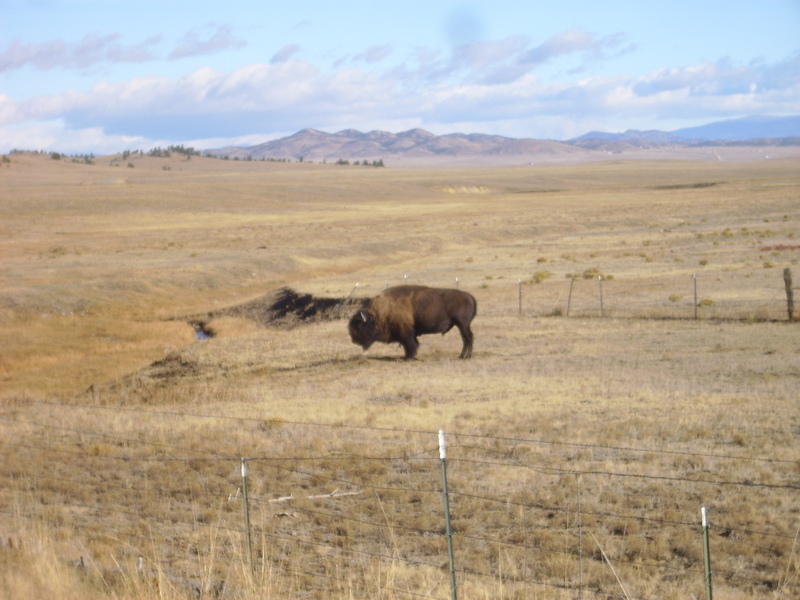 But not before we came across a small herd of buffalo. There were three or four head. They had the look of a domestic herd. Still impressive animals. Working our way back made for much better navigation. We soon found ourselves at an outcropping of Cretaceous Greenhorn Limestone. 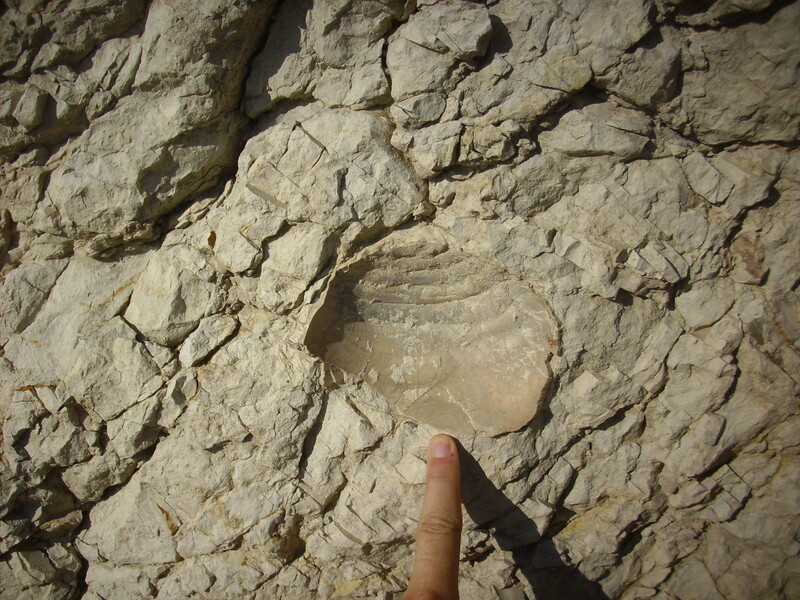 Bruce identified the fossils as oyster shells, which are apparently very typical of Cretaceous marine formations like this one. 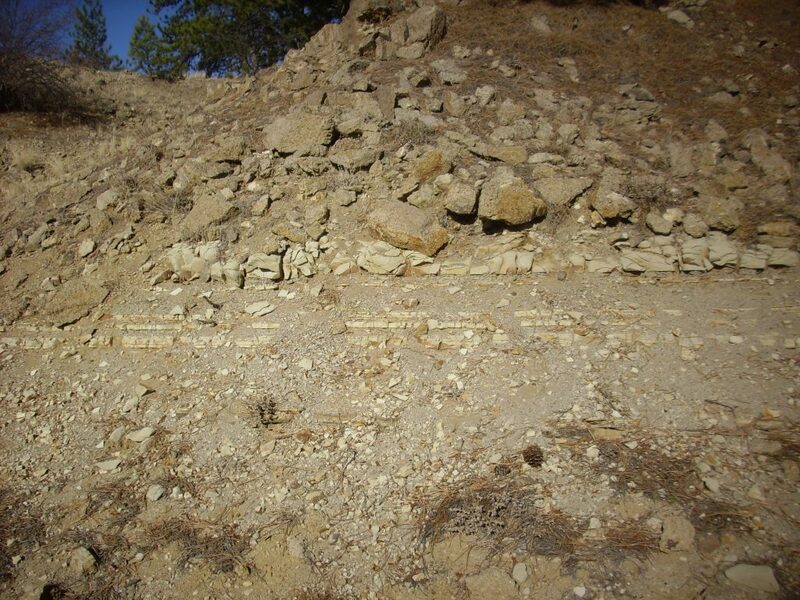 The notable thing is the orientation of the fossils: We’re looking straight at the vertical face of the formation in all these photographs, so the beds must have been tipped nearly vertical by tectonic forces. A little further down, we came to a granite exposure. And here I made my first use of a scale and focusing card, a little gift from Bruce. The rock being focused on is a coarse granite or fine pegmatite consisting largely of quartz, muscovite mica, and potassium feldspar, but the riot of color suggests some interesting accessory minerals. I don’t know what the green patches are, for example. 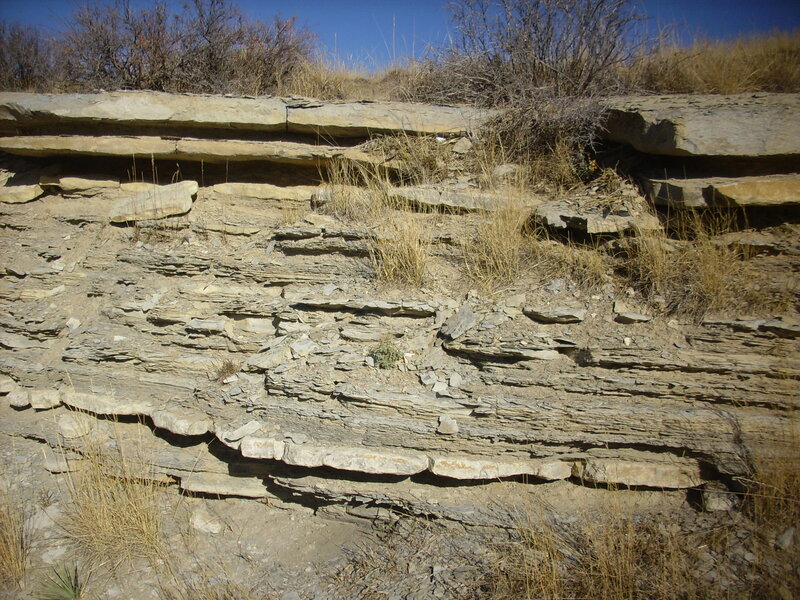 The exposure is cut by a mafic dike. 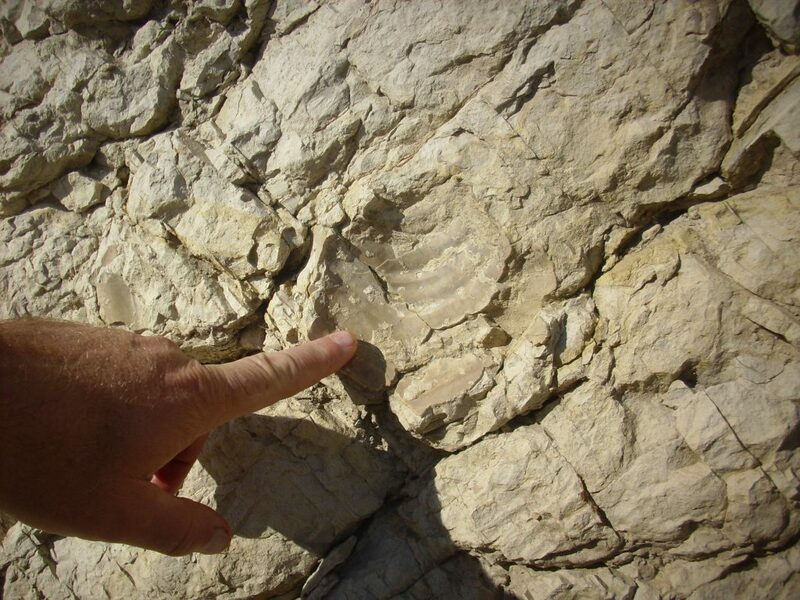 This may have fed magma to a volcano, ten thousand times a hundred thousand dusty years ago. The dike, I mean. Bruce is considerably younger. 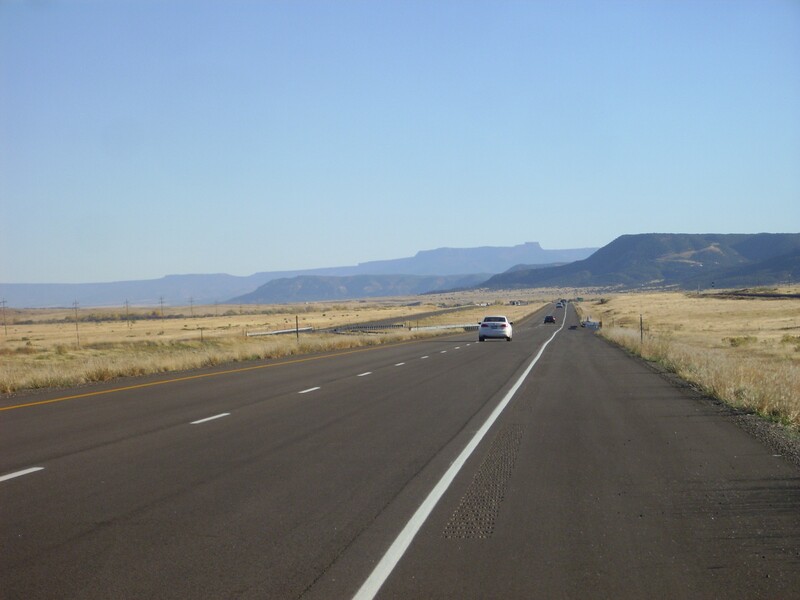 We entered the heart of the Guffey caldera, which collapsed around 25 million years ago. 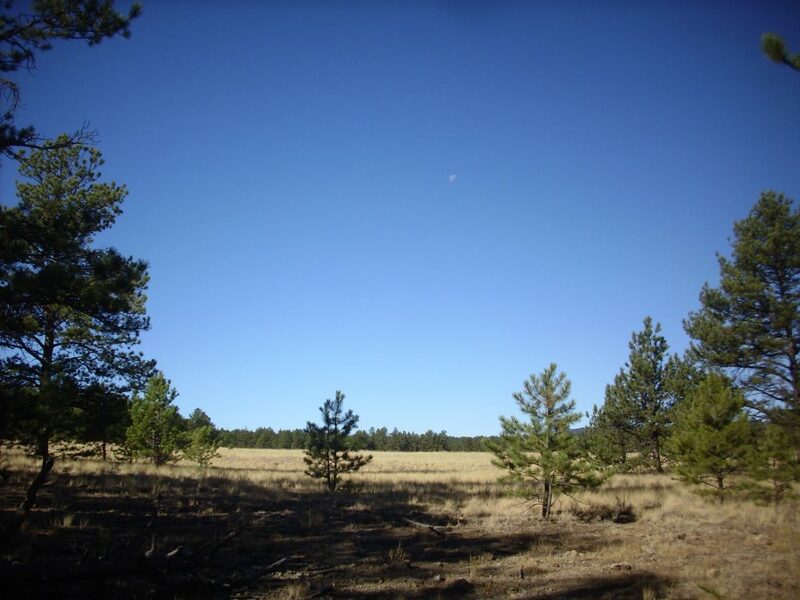 The north rim of the caldera is marked by Thirtynine Mile Mountain. Our road log was old enough to have entries for numerous cattle guards that have since been removed (cattle guards being excellent navigation markers on back country roads.) 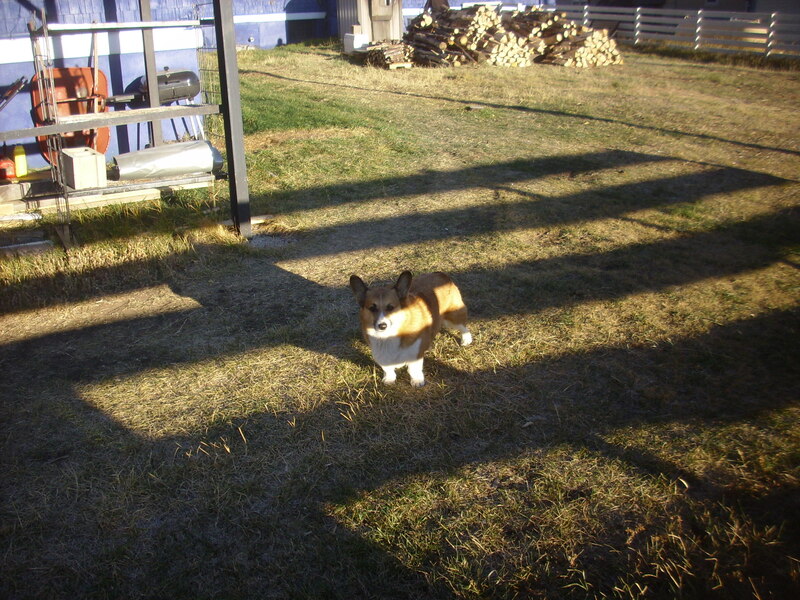 It became a standing joke between Bruce and I that the actual cattle were the guards. Our log took us to a nice outcrop of volcaniclastics cut by an andesite dike. A closer look at the volcaniclastics. 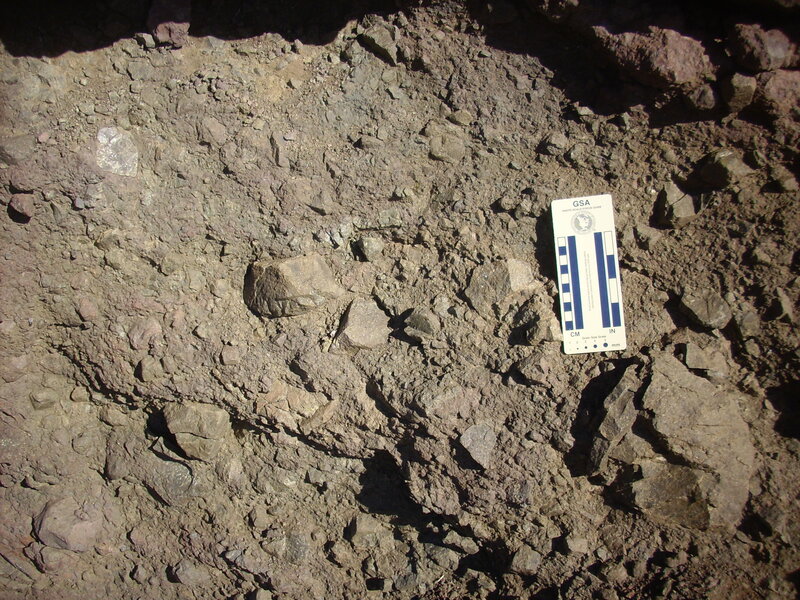 Volcaniclastics are beds of rock fragments eroded from fresh volcanic deposits. These are now well cemented, likely by silica from volcanic ash. 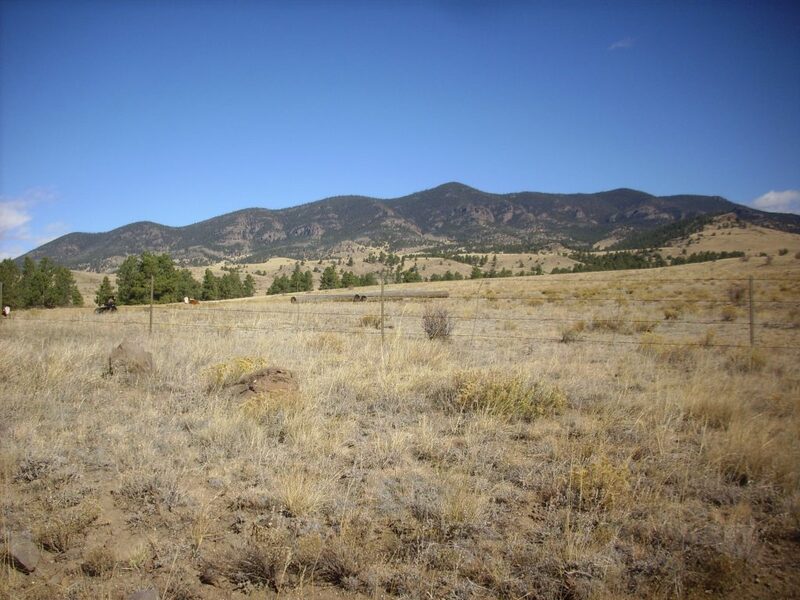 We continued on north, and when we got to the part of Route 9 we had already traversed twice, Bruce decided it might be interesting to drive up onto Red Hill, the ridge alongside the road. This turned out to be capped with Cretaceous Dakota Sandstone (of which I did not think to take a picture) and numerous houses, of which I would love to own one if I somehow became filthy rich. There were some nice views across a narrow valley to Reinecker Ridge, which is underlain by Maroon Formation. I never quite got around to taking a photograph. Back through Fairfield and to points north. These included the “highest high in Colorado”. 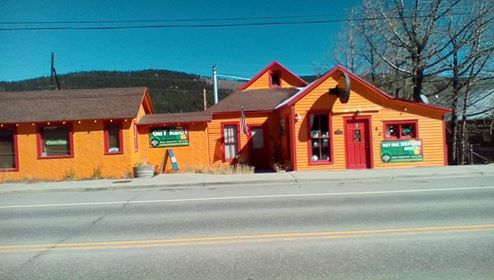 Marijuana shop in Alma, which claims to be the highest town in Colorado. Further up is a magnificent view of Mt. Bross and Mt. Lincoln. 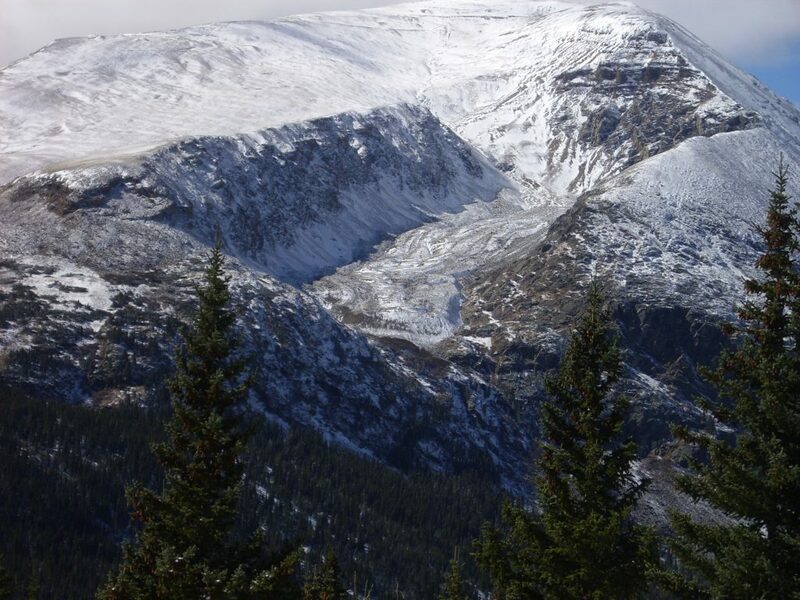 Bruce spotted what looked like a rock glacier in a hanging valley on the northeast flank of Mt. Lincoln. Our guide book confirmed this. 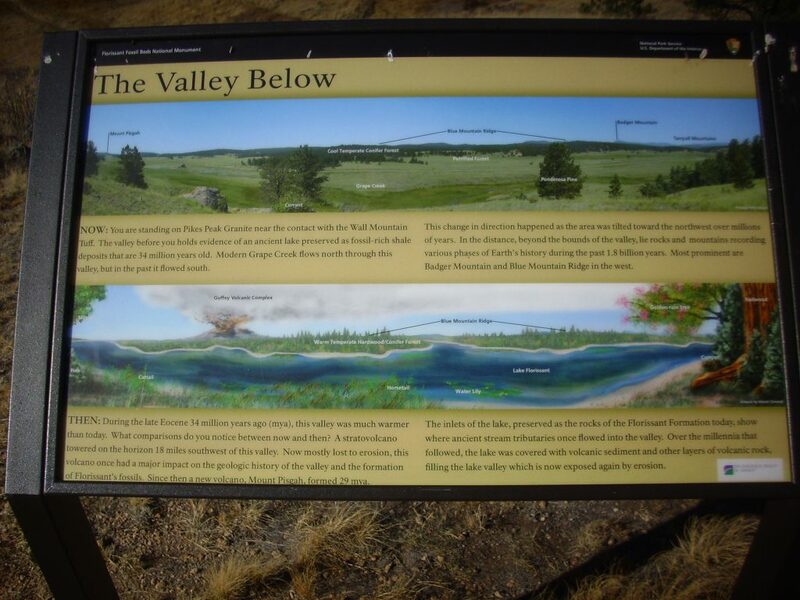 The hanging valley is a result of glacier activity; during the height of the last glaciation, a glacier ran down this valley and joined a larger glacier in the foreground valley. Now the valley is occupied by a rock glacier, which is a mass of boulders held together by permanent ice that can flow something like a conventional glacier. There were never any conventional glaciers in the Jemez, so far as we know, but there are several candidates for inactive rock glaciers. Opposite this pullout the road cut a moraine, a deposit of rubble typical of glacier activity. We were at the end of the road log. We turned around and headed back to Fairplay. Turns out there’s a gravel road crossing the mountains west of Alma, and it passes some mines and cool geology. Bruce was interested, but we decided that’s for some other day (in warmer weather). 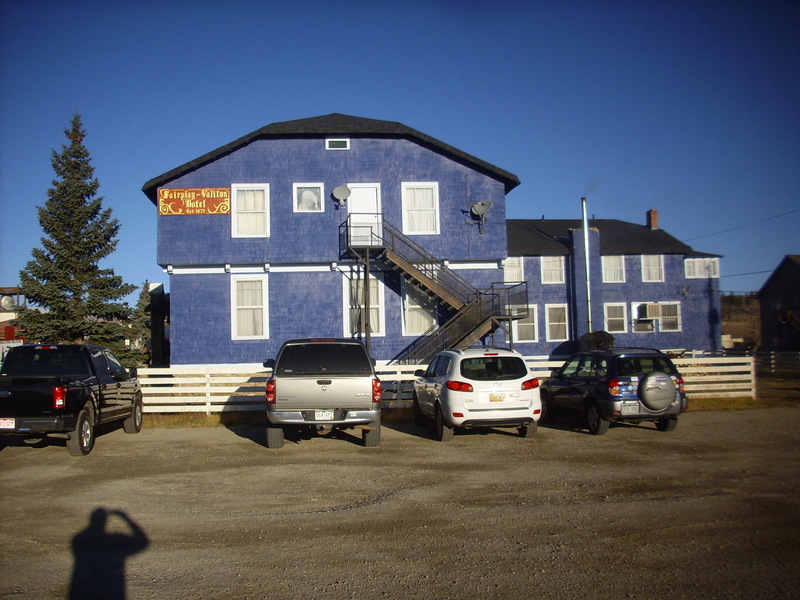 We were getting a little tired of Asian food, so we ate at a bar and grill in Fairplay; here, perhaps. The special was cream of mushroom soup and a patty melt; I ordered sweet potato fries as well. (To neutralize the grease in the patty melt, y’know.) The cream of mushroom soup was unique in my experience, quite salty, not that creamy, and with a quarter inch layer of olive oil on top. It was actually quite delicious. We went over road logs and decided to head back to Guffey and take the road to Florrisant. This would give us a nice view of some of the features of the Guffey caldera. 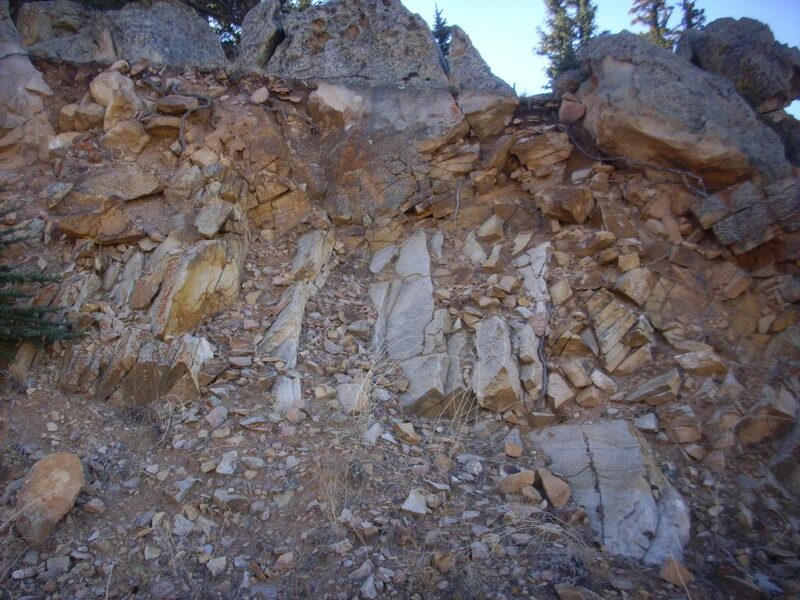 Our first stop was an outcrop of sheared rhyolite. This is well within the caldera — near its center, actually — so it’s not part of a ring fracture zone. I’m not sure of its significance without the road log to remind me. The log took us through the caldera and towards its eastern margin. 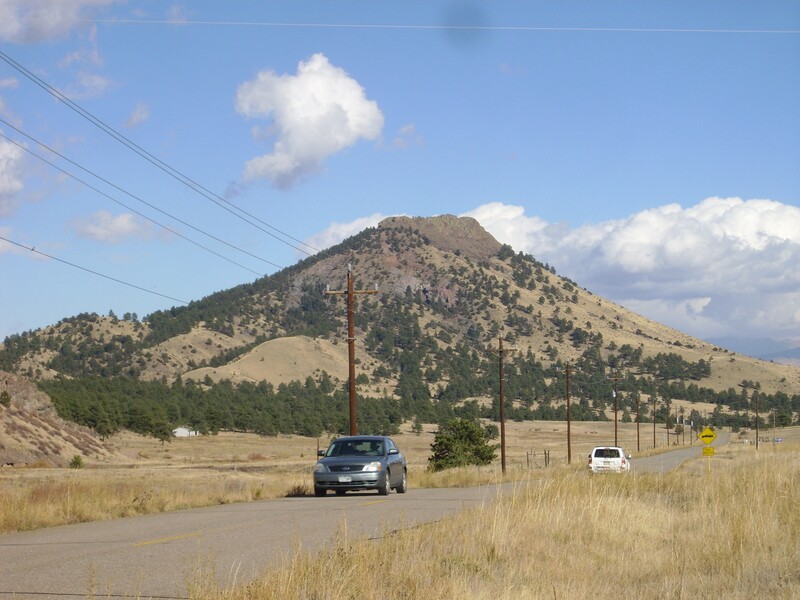 This is Castle Mountain, which forms part of the heavily eroded northeastern topographic rim of the caldera. Note the layered flows at its top. Mt. 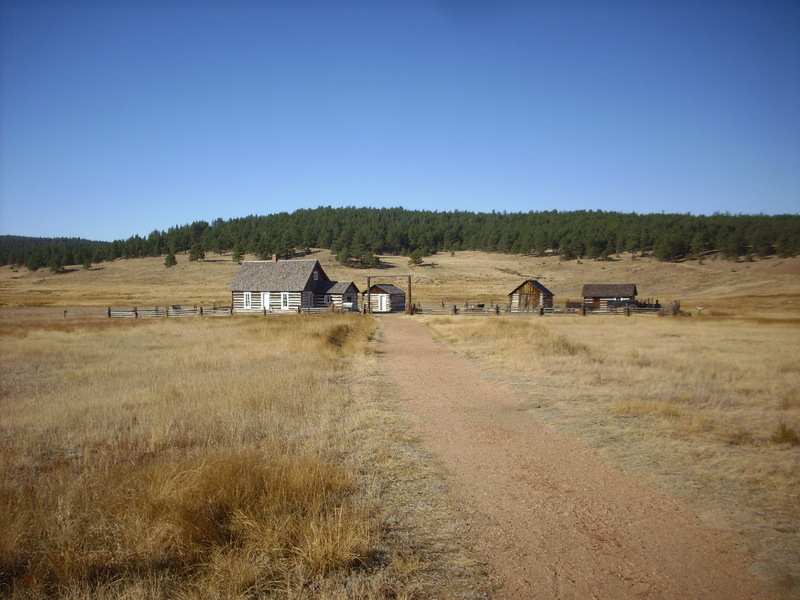 McIntyre, part of the eastern caldera rim. 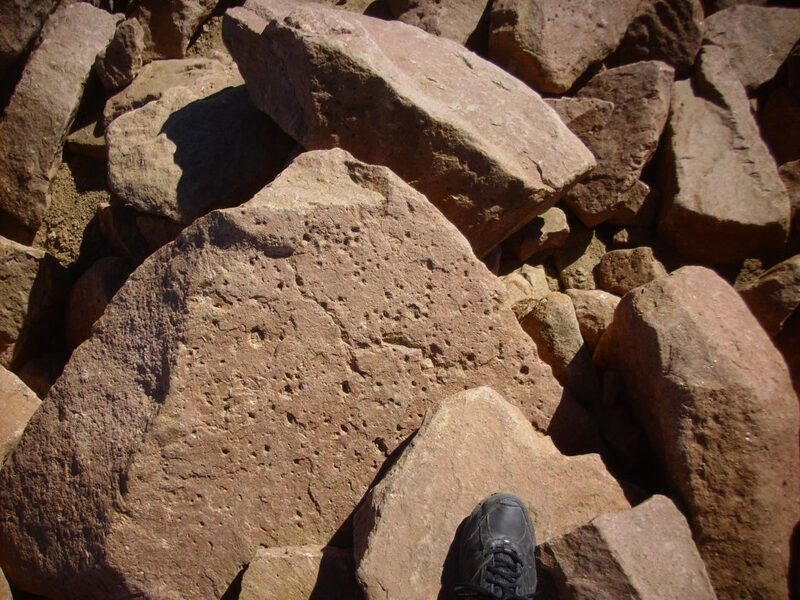 Now well outside the caldera, we found ourselves in the Pikes Peak batholith, a massive body of granite intruded 1.1 billion years ago. 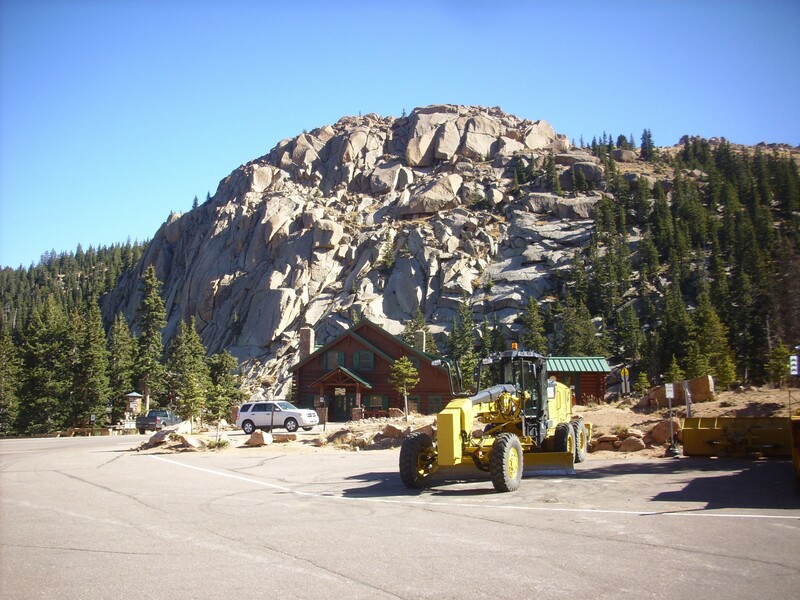 The granite weathers in a distinctive way, producing equally distinctive domes. 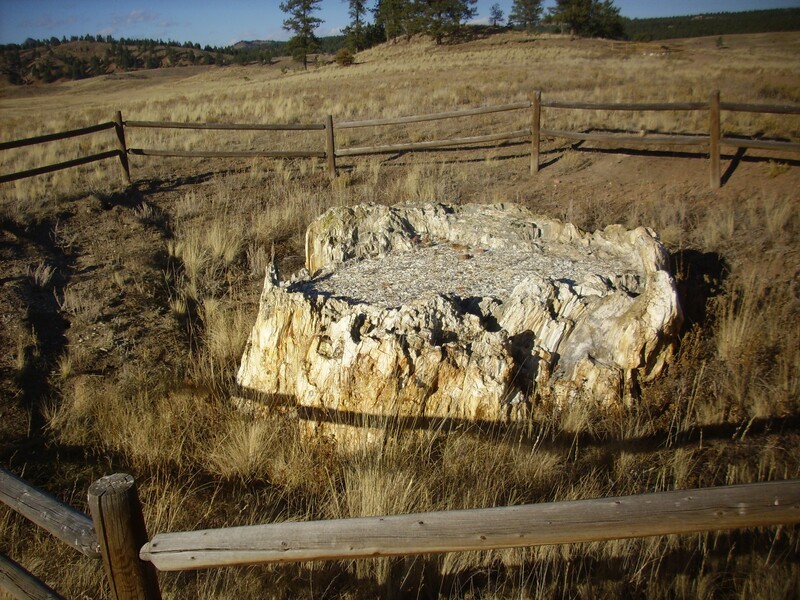 From there to Florissant Fossil Beds National Monument, noted for its amazingly well-preseved petrified wood. 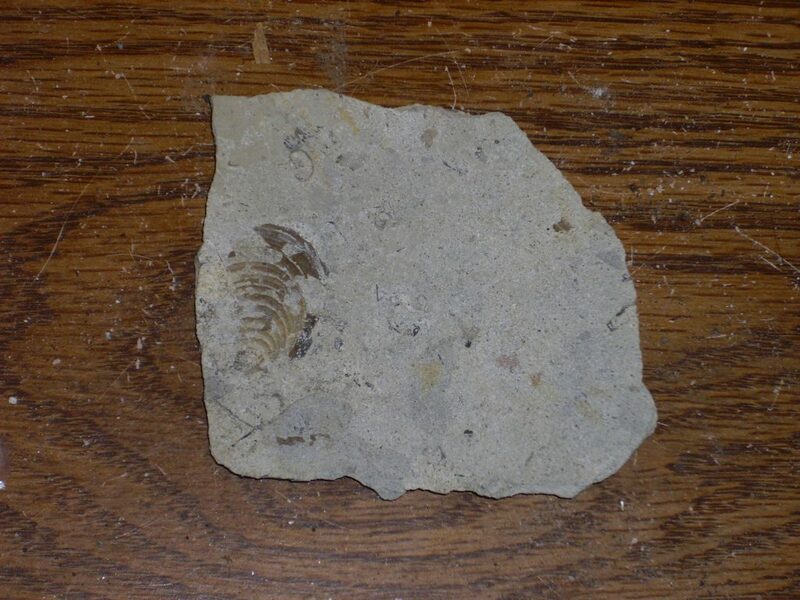 The fossil in the last photograph is unique. 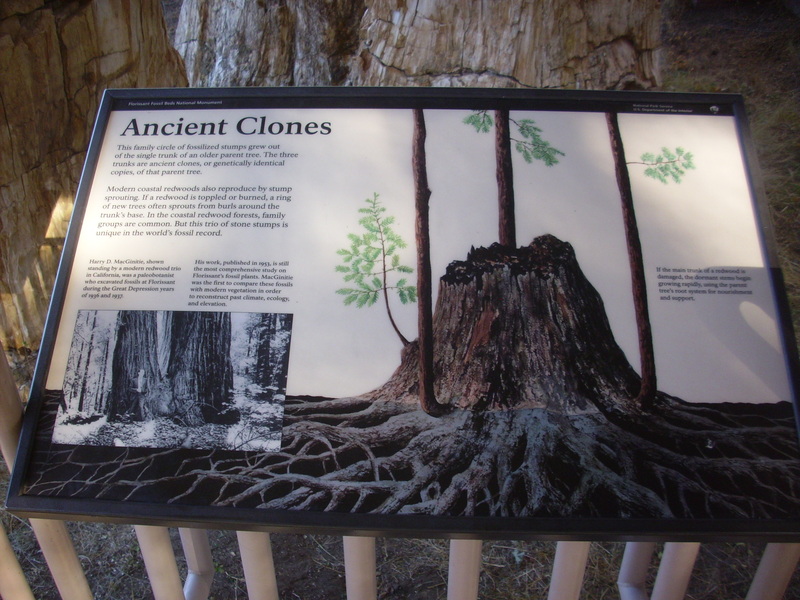 The trio of stumps are clones that grew around an original stump that was toppled or burned. 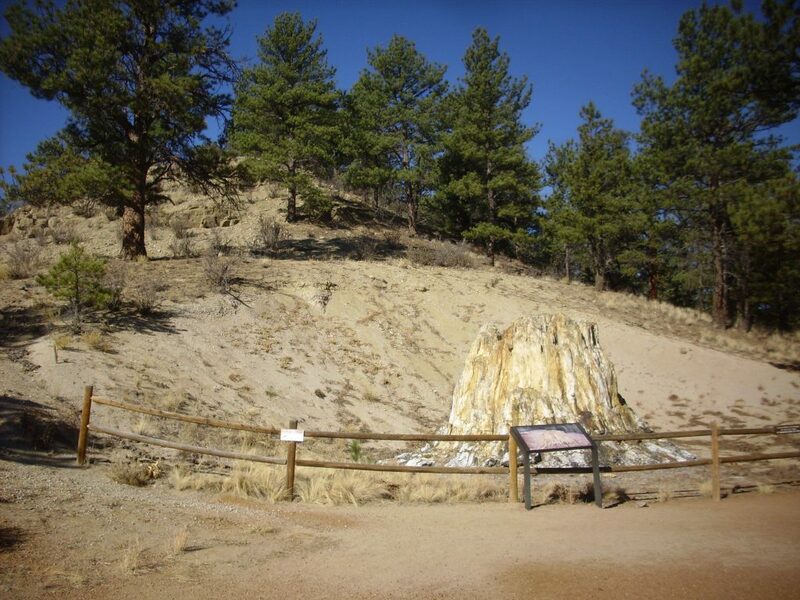 From the visitor’s center, a trail takes you to additional stumps. 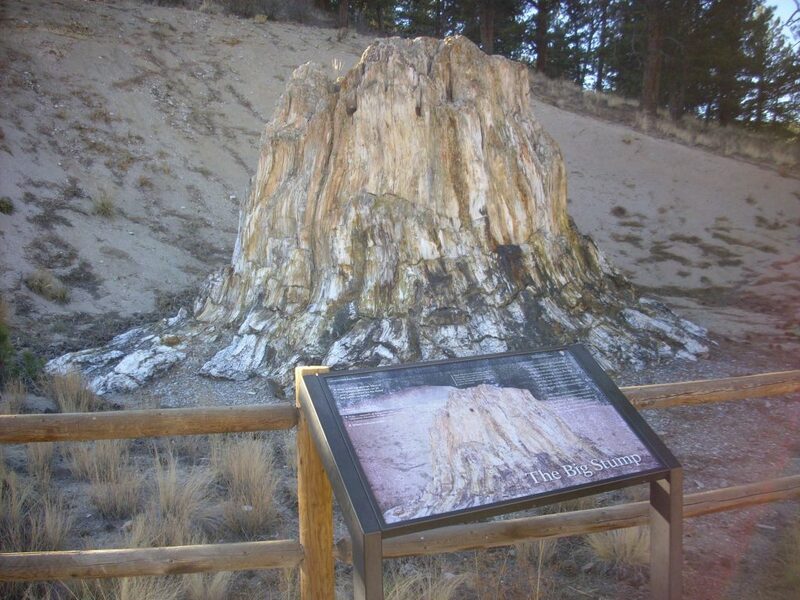 This is the Big Stump. This one is encrusted with lichens. This one has a peculiar flat upper surface. And this one is almost buried. All these stumps are of giant redwood trees, a species now found only along the California coast in a region of warm, wet climate. 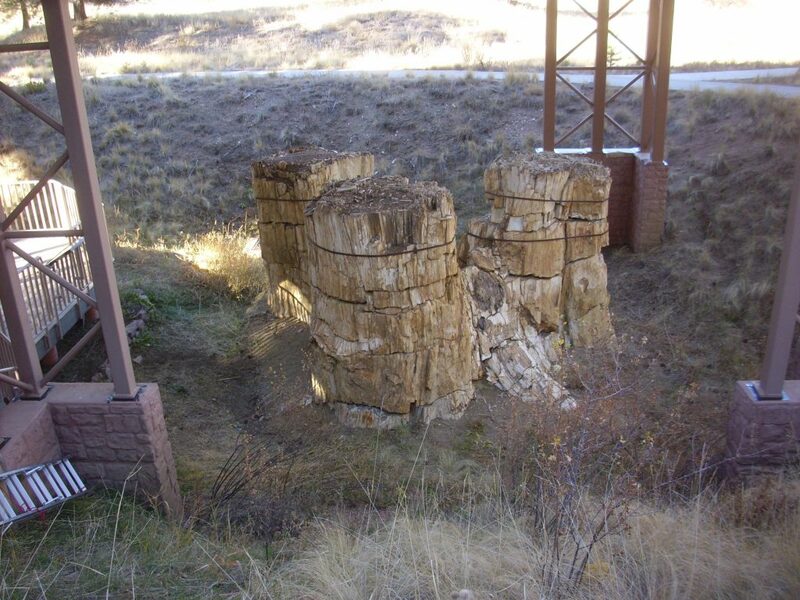 The climate here in central Colorado is inferred to have also been warm and wet 25 million years ago, when these stumps were buried by a mudflow from the Guffey volcano. 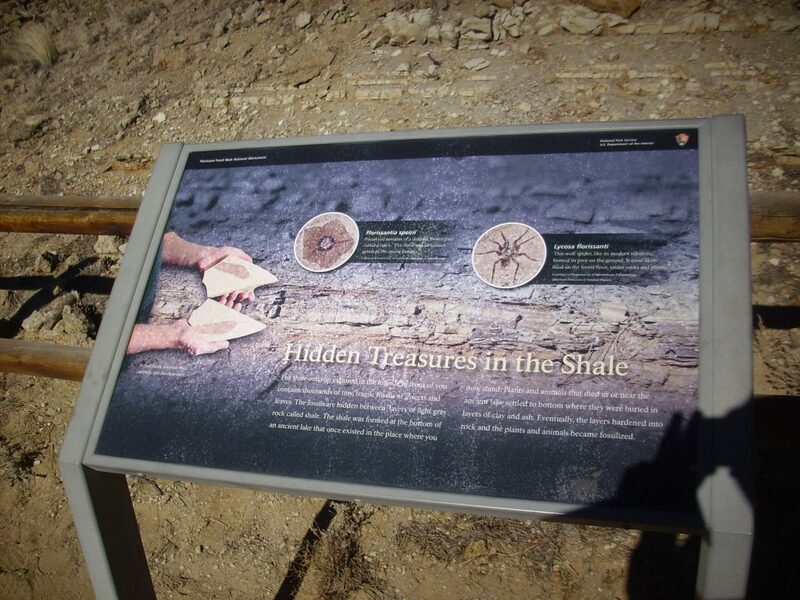 The ash-rich mud silicified the wood in the stumps to yield almost perfect preservation. 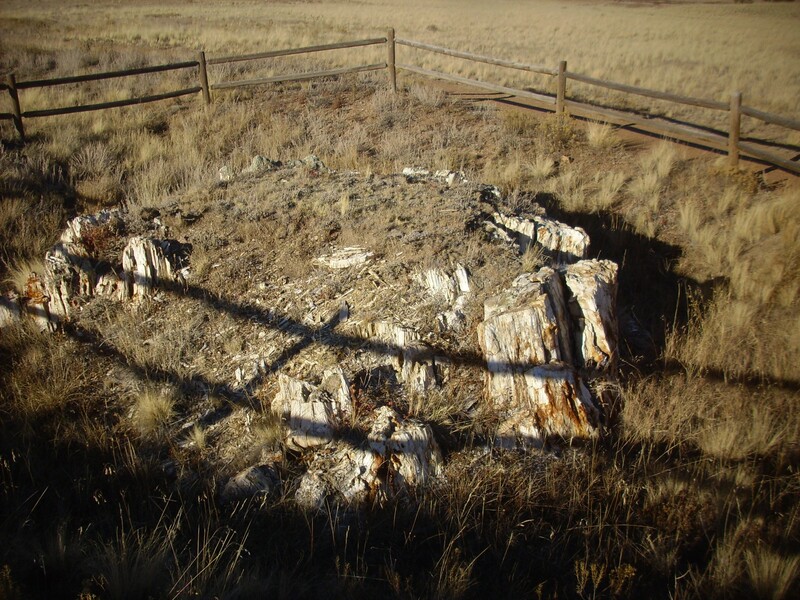 It’s uncanny how well the petrified wood has been preserved. 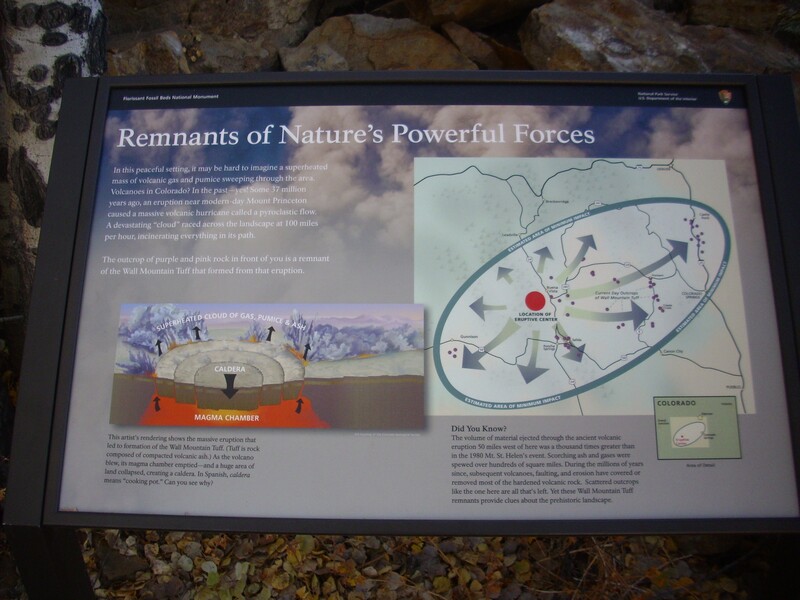 There was a geology trail on our map of the monument, but it was too late in the day. We headed back, too tired to do more than note a couple of interesting road cuts along the way. Dinner was at the local Italian restaurant, which was surprisingly good for a town of 911 persons. I had chicken penne, but did not dare eat all the penne pasta. I was also feeling slightly queasy. Sure enough, I woke up in the middle of the night feeling just awful. Not quite bad enough to actually upchuck, but close. By the time morning came, the worst was over, but I had no appetite at all. Don’t know if it was the breakfast bagel, the cream of mushroom soup, or just a random virus. Probably not the chicken penne, since I was already starting to feel a bit queasy by then. Turns out the hotel is over a hundred years old. I had decided I would take Route 9 yet again, then head to Colorado Springs along Route 24. I have a sister in Colorado Springs; I knew her house was on Descanso Circle and I had a vague idea how to get there, but not clearer directions and not even a phone number. I decided I would trust my luck. I paused just outside Fairplay for a last photograph of the placer tailings from the old gold mining days. And a stop along the road to photograph one of the fens. The fens of South Park are apparently famous among ecologists, since they are relatively isolated communities of species found nowhere nearby (and, in some cases, nowhere else.) 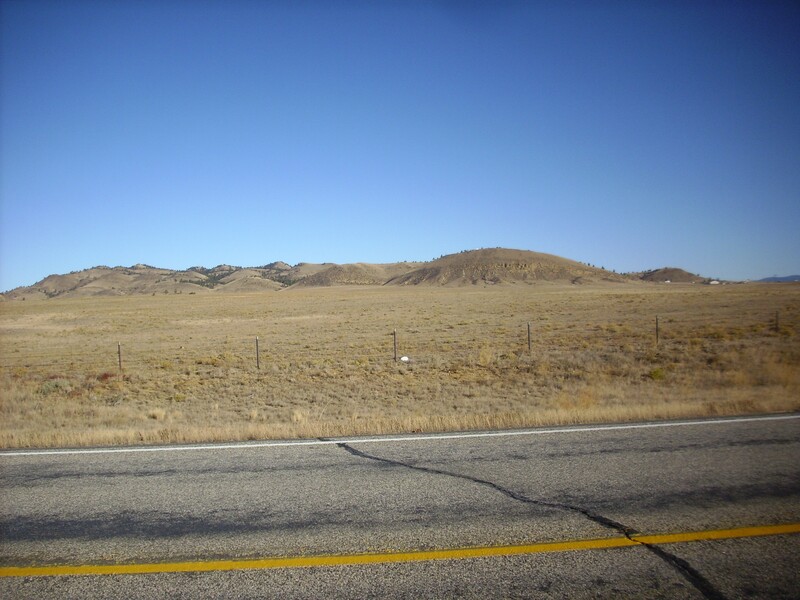 The nearest comparable ecosystems are in northern Wyoming. Bruce did some field work in similar fens once upon a time; he reports that the deer flies are numerous and aggressive, with a truly impressive bite (“analogous in mode of action to a paper punch”) and the only protection is to bathe in DEET every morning. 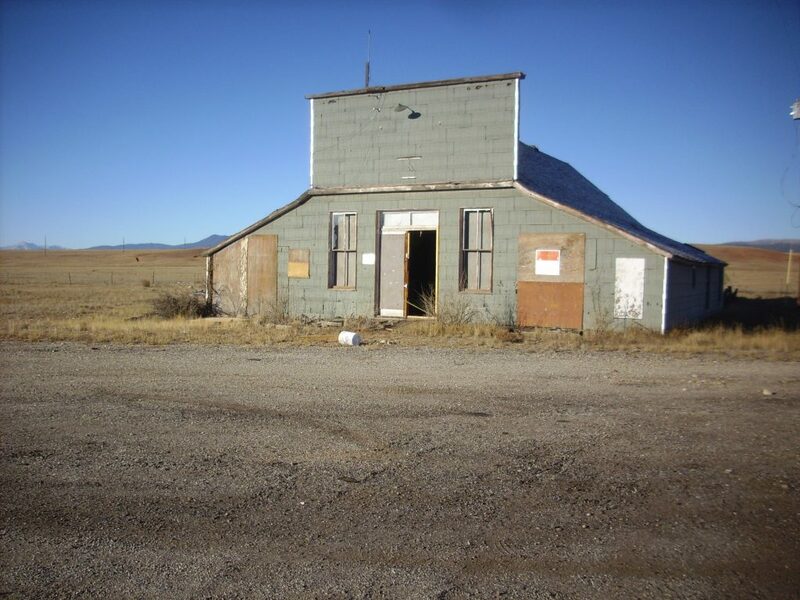 Through Garo one more time, and I finally took a picture of the old post office. 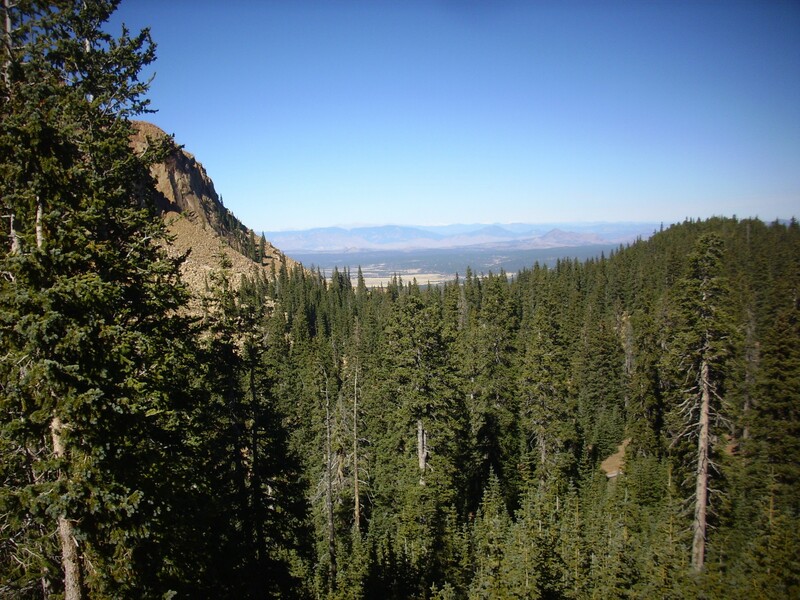 A view of the Guffey Caldera rim, from way north. The mountain on the skyline at left, between the two telephone poles and looking over nearer hills, is Thirtynine Mile Mountain on the northeast caldera rim. 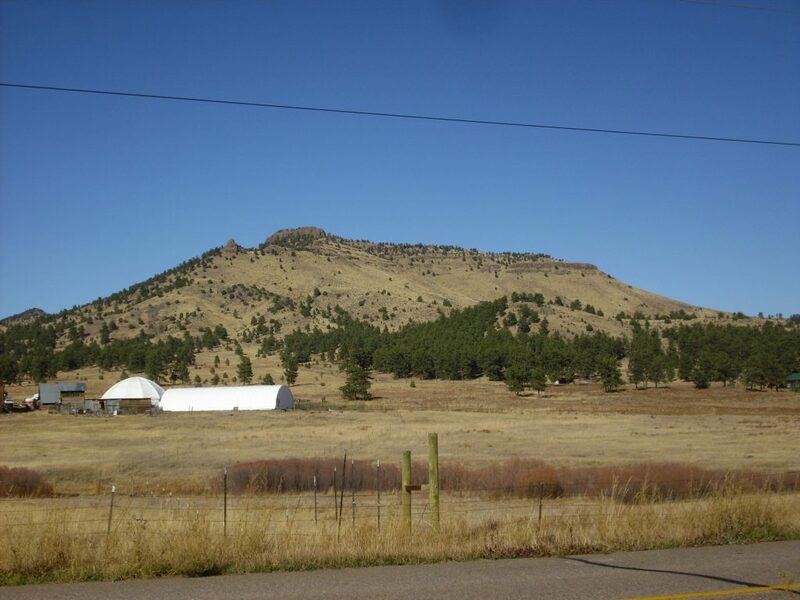 The mountain just peeking over the foreground ridge at the right side of the photograph is Black Mountain on the southeast side of the caldera. This gives you some idea how large the volcano was before it collapsed. Some Garo Sandstone outside Hartsel. Or at least I think so; my map is ambiguous. 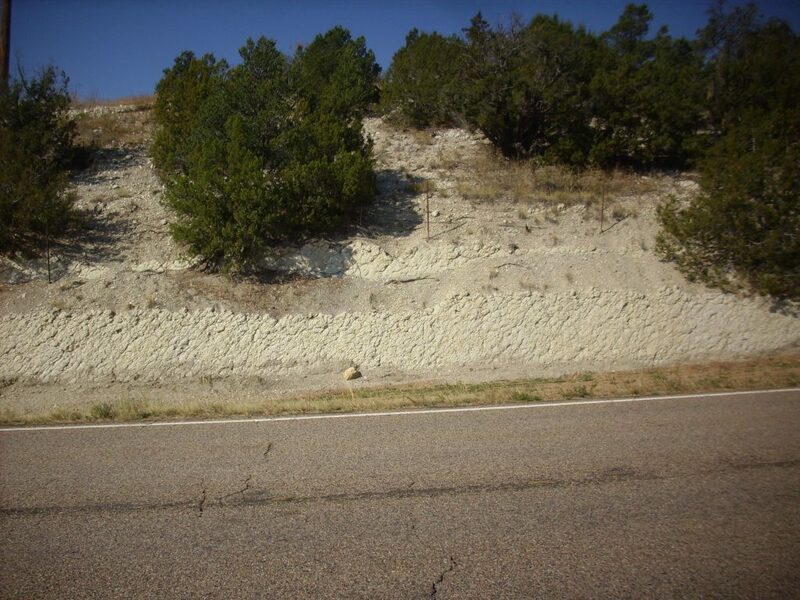 But I pulled over because I thought this might be Wall Mountain Tuff, which I had not yet seen close up. It turned out to be a sandstone, not a tuff. Tuff luck. Onto 24 and off to Colorado Springs. 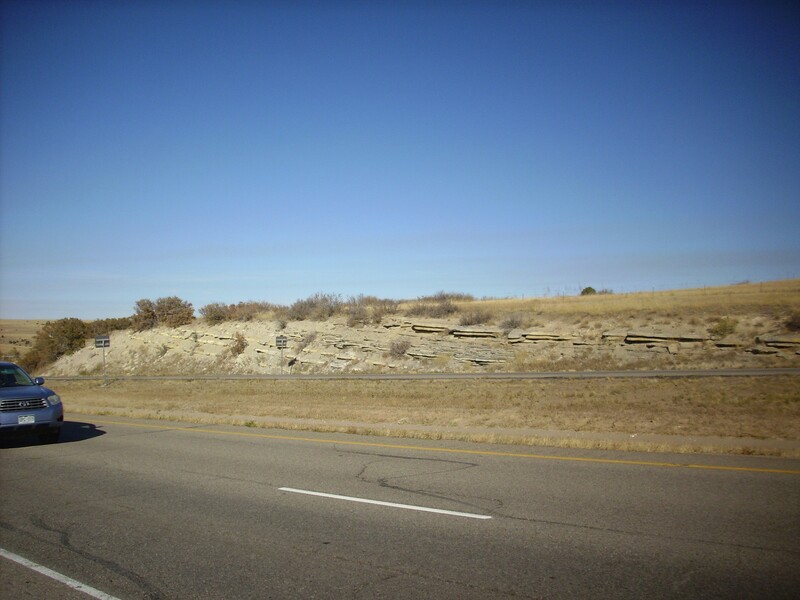 I passed what my road log described as the south end of an anticline. This is either Fox Hills Sandstone or South Park Formation, or both, based on the geologic map for the area. 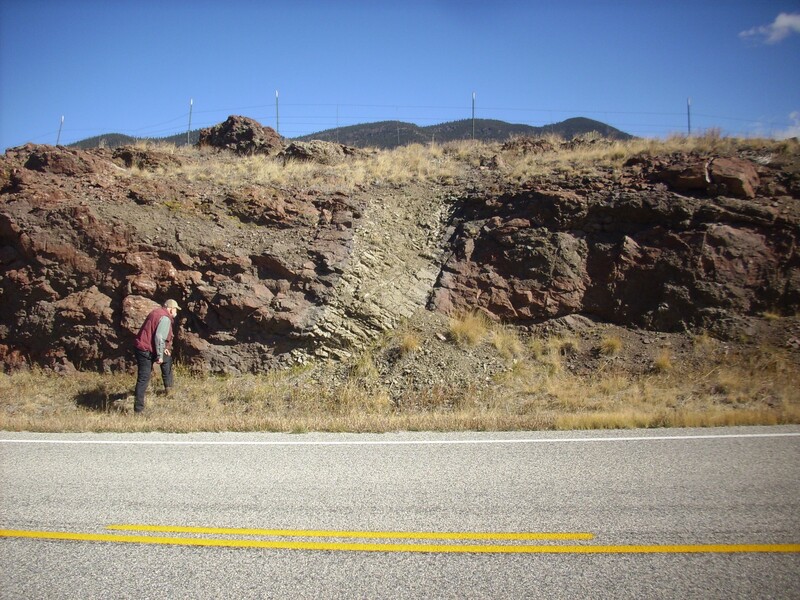 Leaving South Park, I came across a pegmatite dike Bruce and I had reconnoitered the previous day. 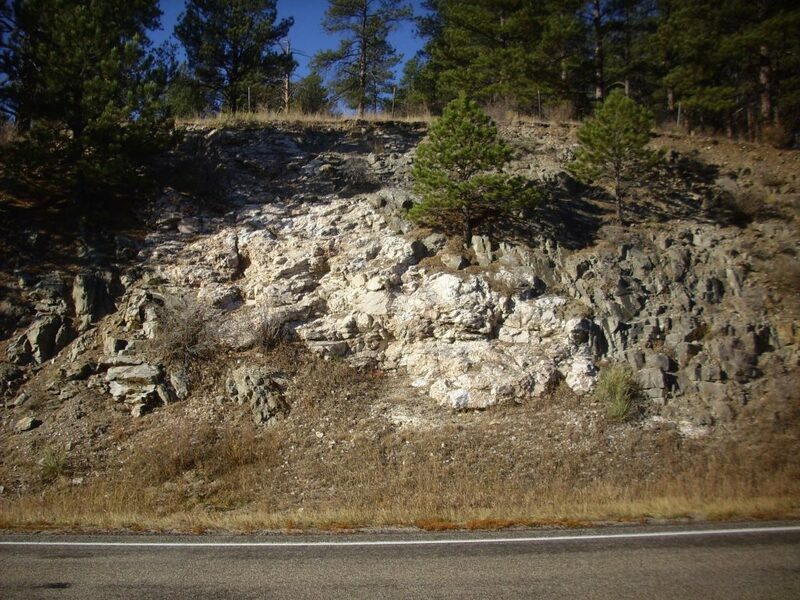 This is a location where high-silica magma forced its way through older, lower-silica rock (of a type called amphibolite) to form a pegmatite. 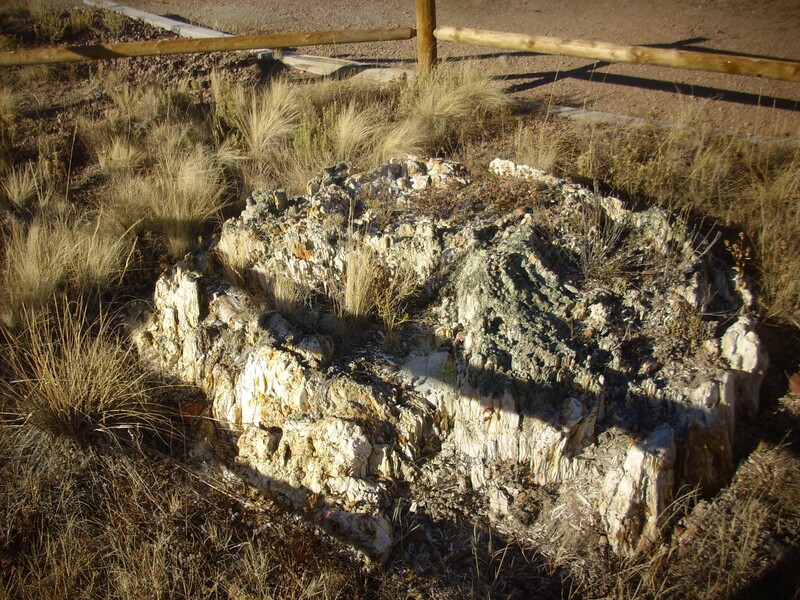 Pegmatites are known for their very coarse crystals and, in some cases, for unusual minerals. Both rocks are very ancient here, dating back at least a billion years. It’s a fairly unremarkable rock containing mica and hornblende, with some feldspar. 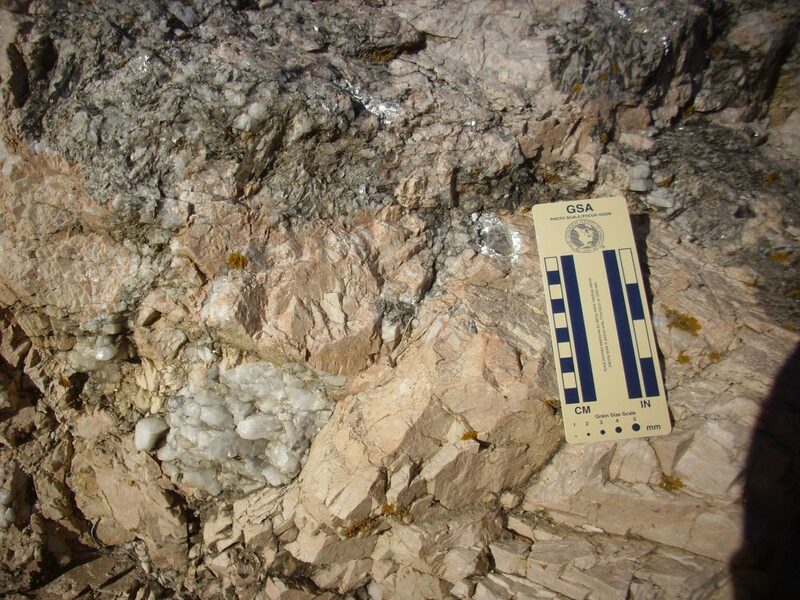 You can see individual very large crystals of pink alkali feldspar and white patches of quartz, along with large flakes of muscovite mica. 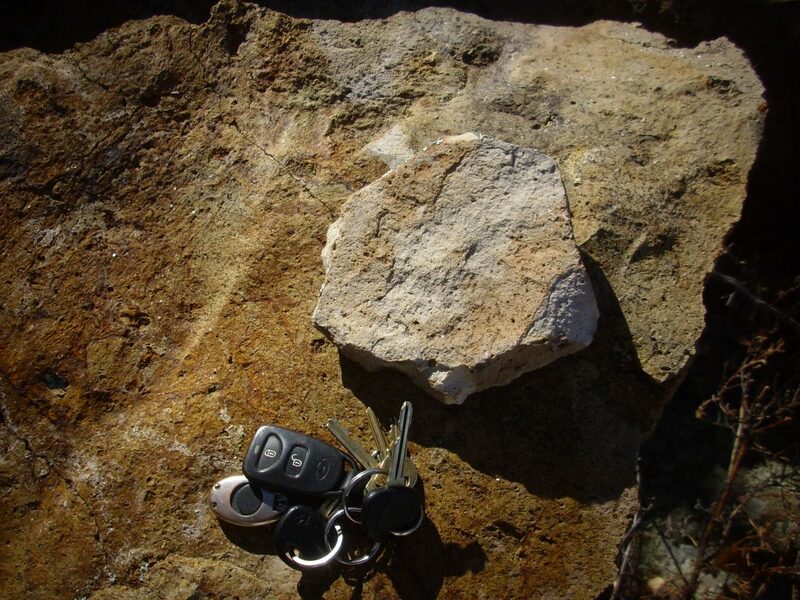 This is a simple pegmatite, so called because it lacks much in the way of unusual accessory minerals. 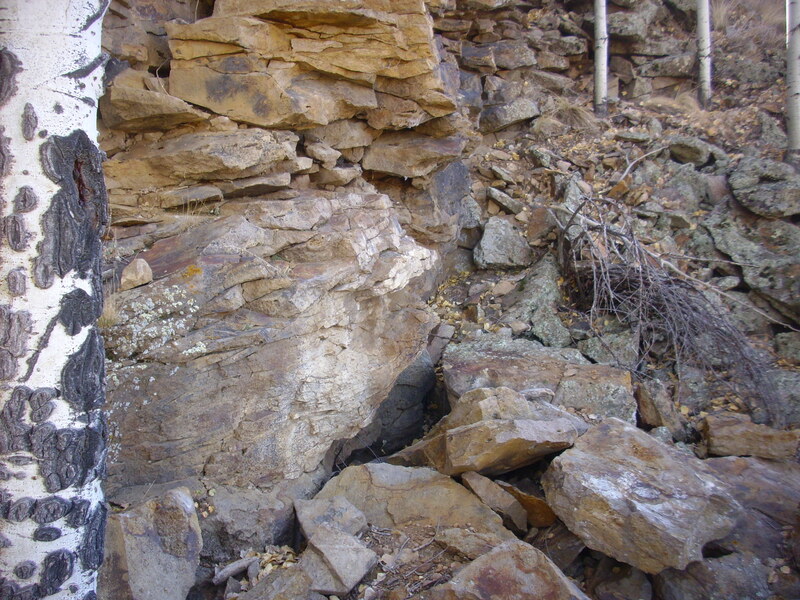 The amphibolite was also intruded by a dike of a very low-silica rock called a lamprophyre. This is a rock very low in silica but high in alkali oxides. It forms when the Earth’s upper mantle undergoes very slight melting, producing relatively small quantities of a magma rich in those components that melt at the lowest temperature. 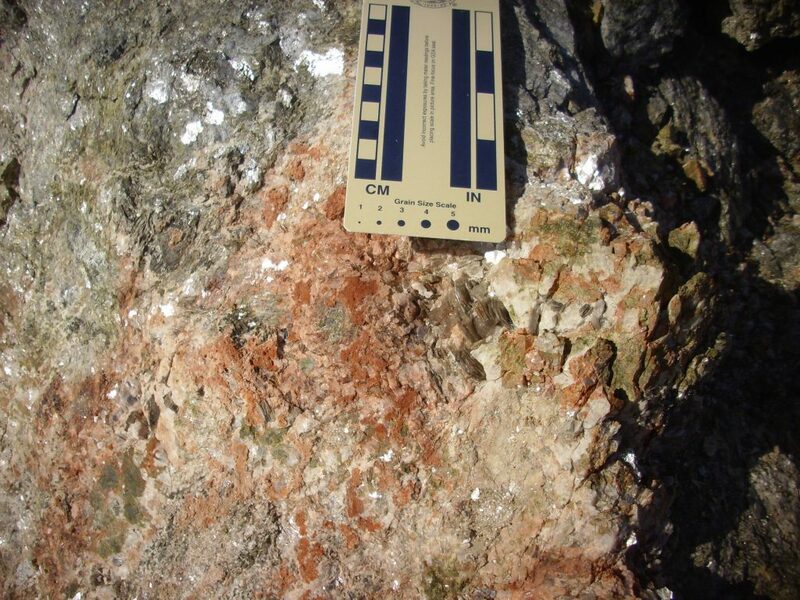 The sample here is rich in mica and amphiboles with small quantities of feldspar. 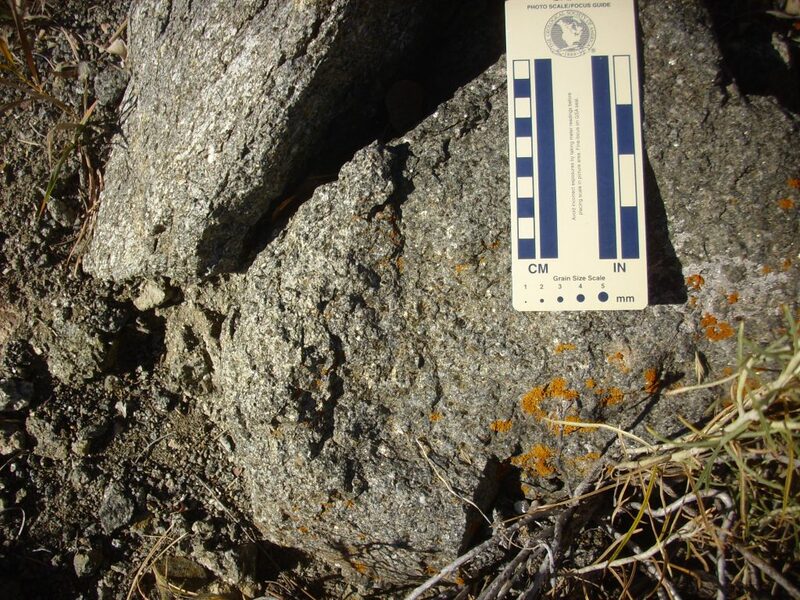 The rounded appearance of the weathered rock is typical of lamprophyres. 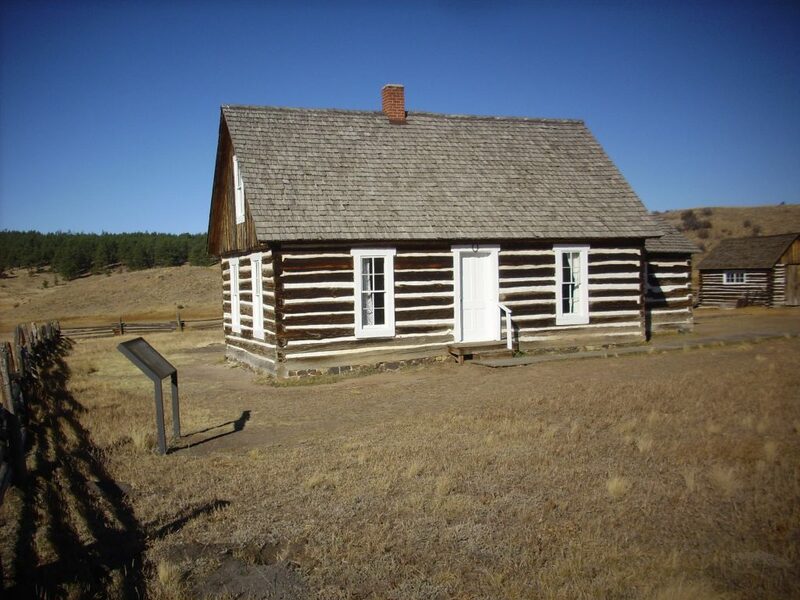 There is a restored pioneer cabin at the monument. I honestly do not know what this is. No explanation posted. Storm cellar? No need in this area and too far from the house. Root cellar? Too far from the house. Mine adit? It’s into a bank of dirt. 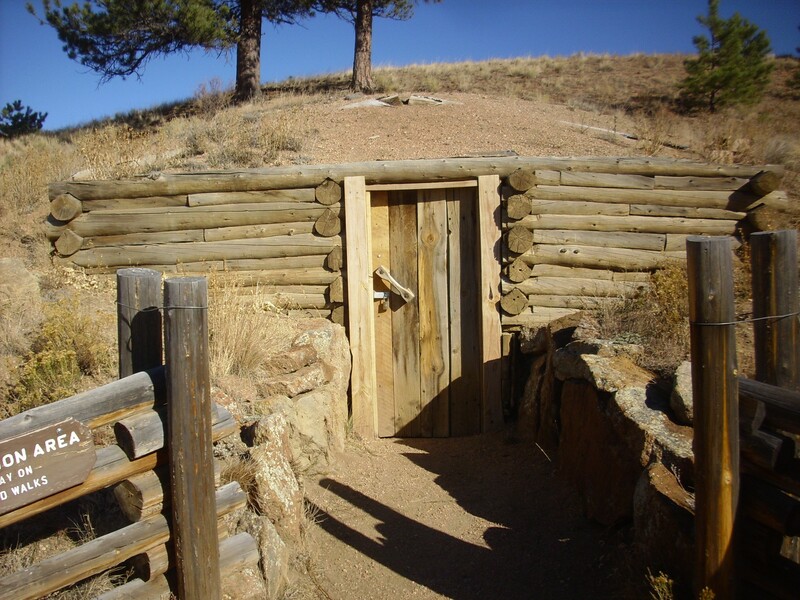 Ice house? Seems as likely as anything. Y’know, I don’t know why the signage at all the new national monuments has to be written for sixth graders, meaning, written at a third-grade level. Perhaps it’s ironic that three buses full of middle schools students pulled into the monument headquarters about the time I did. 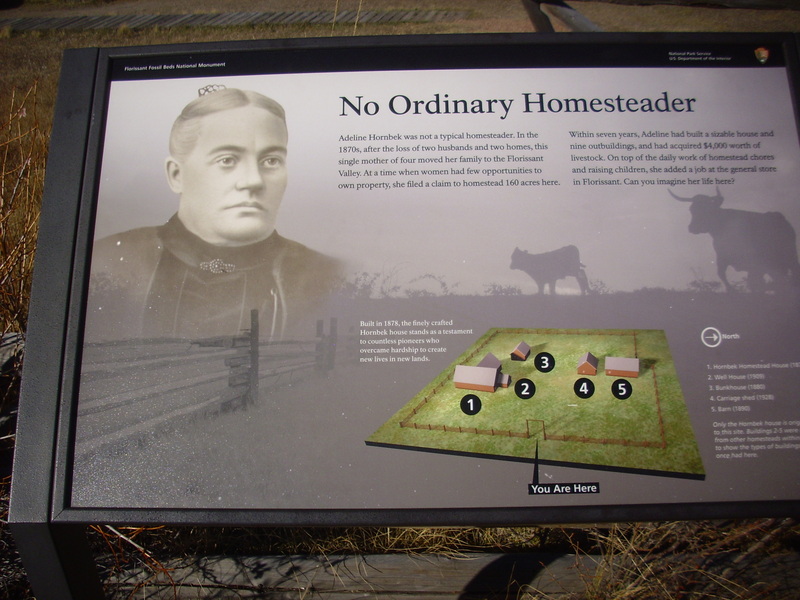 A closer view of the original homestead. 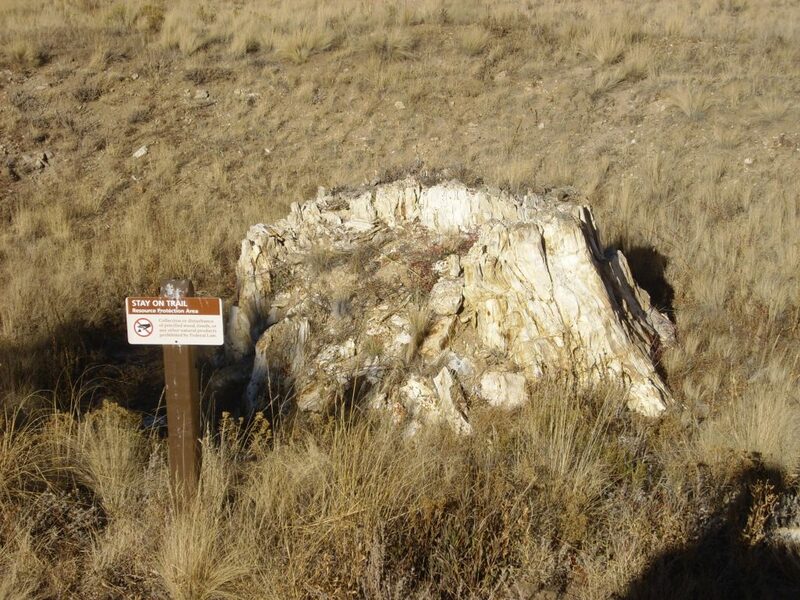 I went to the main headquarters area for a few more photos of petrified wood. And of the local geology. 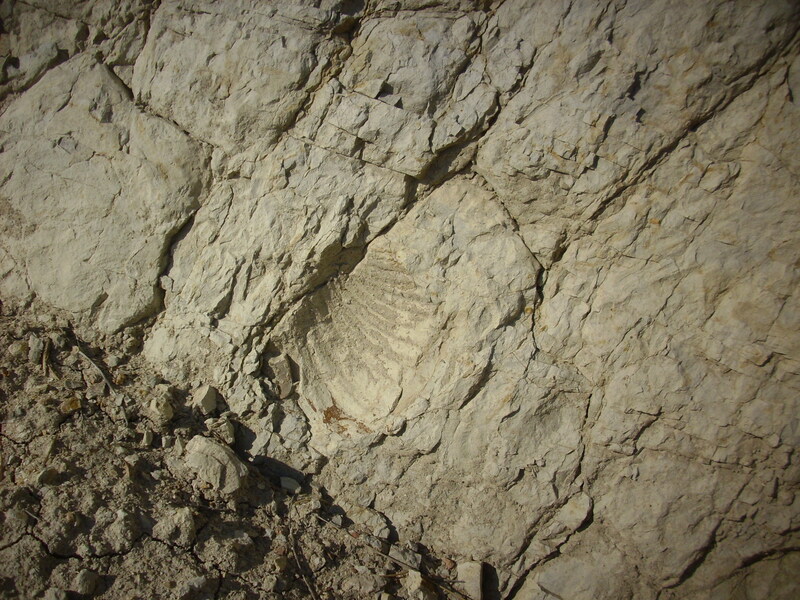 This is a particularly fine exposure of the ancient lake beds in which many insect and leaf fossils are found. Above, a beautiful big moon in a cloudless sky. I walked out to Big Stump again, this time paying attention to the surroundings. 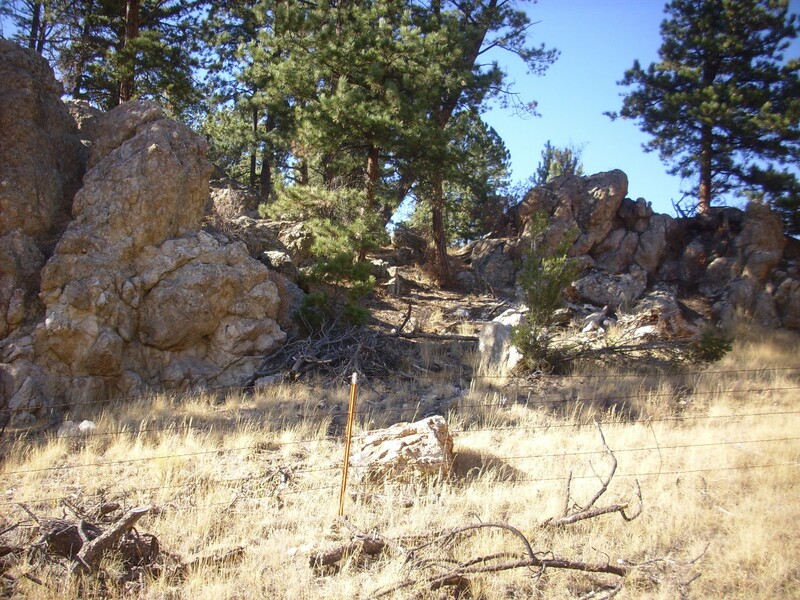 The rock here is assigned (naturally enough) to the Florissant Formation. 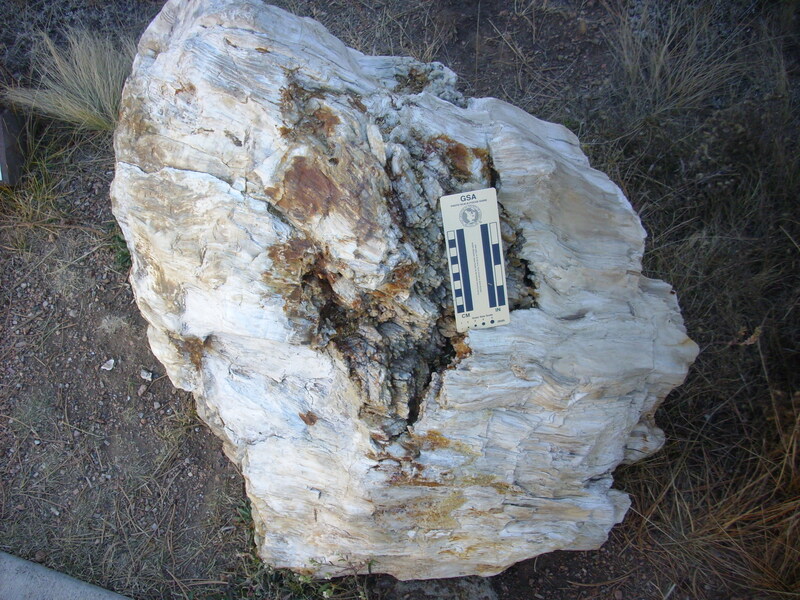 You can see that stump is located in a bed of relatively soft sediments, which is capped with harder conglomerate. I found the geology trail, which took me across the highway to show me some of the local rocks. 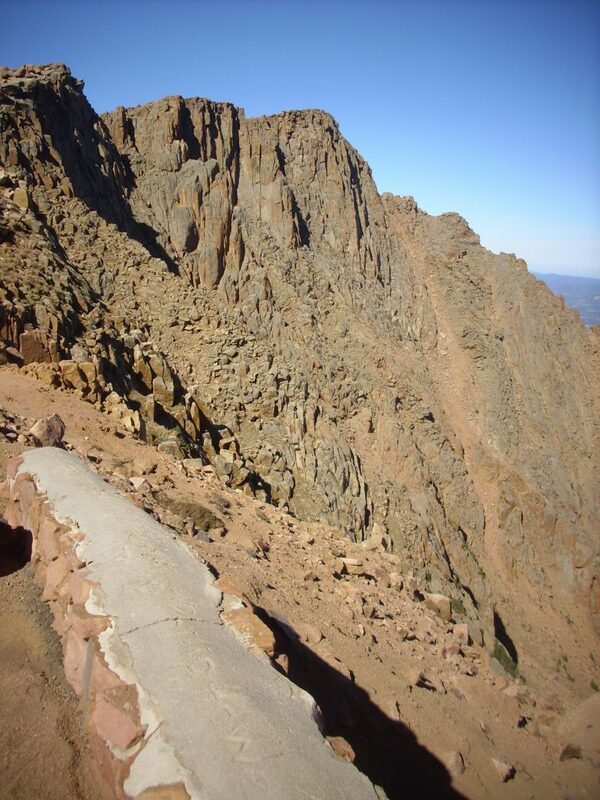 The first stop was at an outcropping of Pikes Peak Granite. 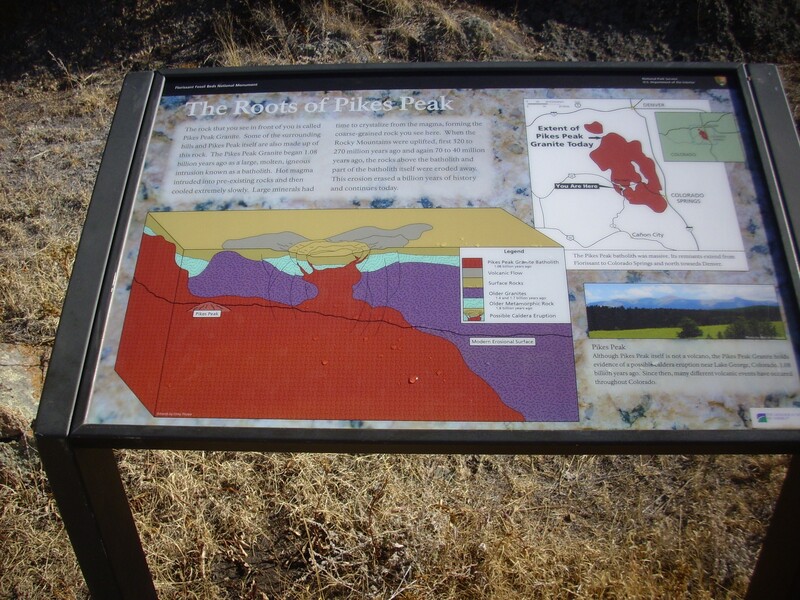 The Pikes Peak Granite is part of a huge batholith, or body of solidified magma, with an age of about 1.08 billion years. 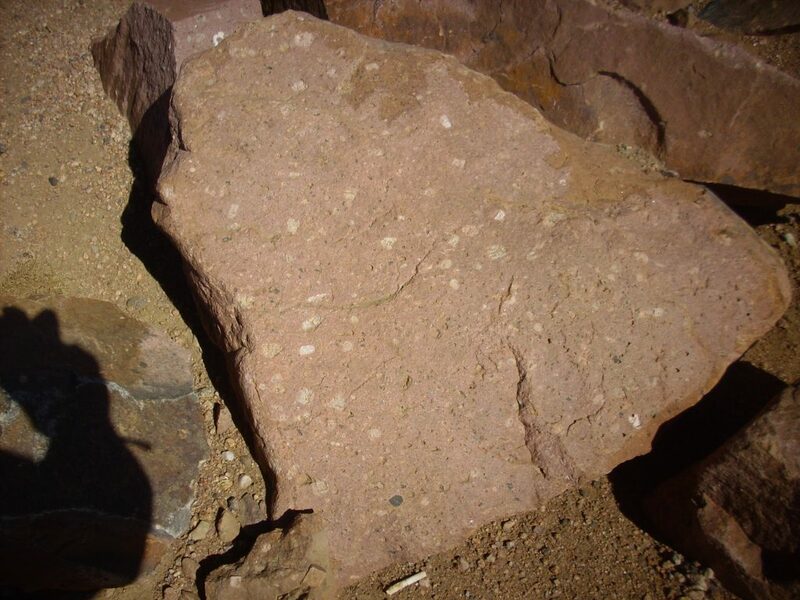 One always suspects that some of the magma of a large batholith escaped to the surface in caldera eruptions, but in a batholith this old, the surface traces would have been eroded away a billion years ago. But the sign claims there is some evidence for such a caldera still detectable in the Lake George area, through which I had already driven. Interesting. 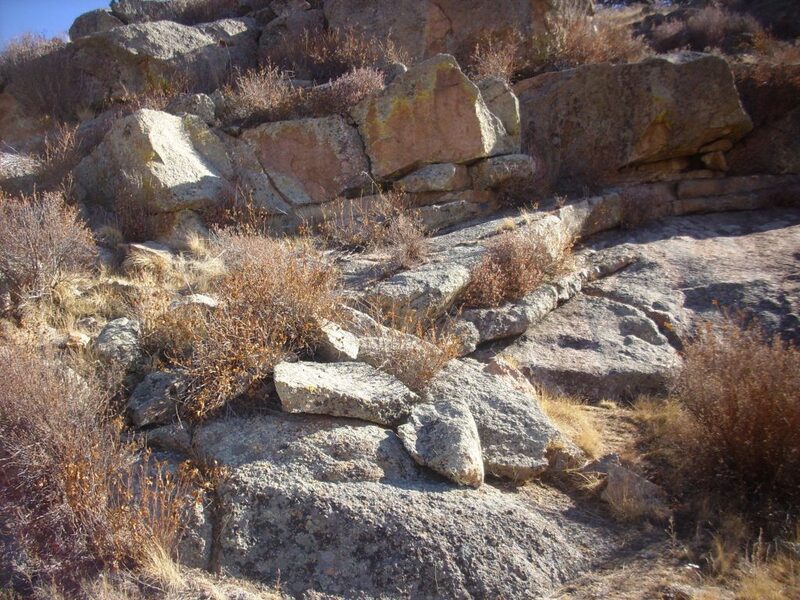 I hiked further along the trail to an outcropping of Wall Mountain Tuff. The trail ended at an overlook. 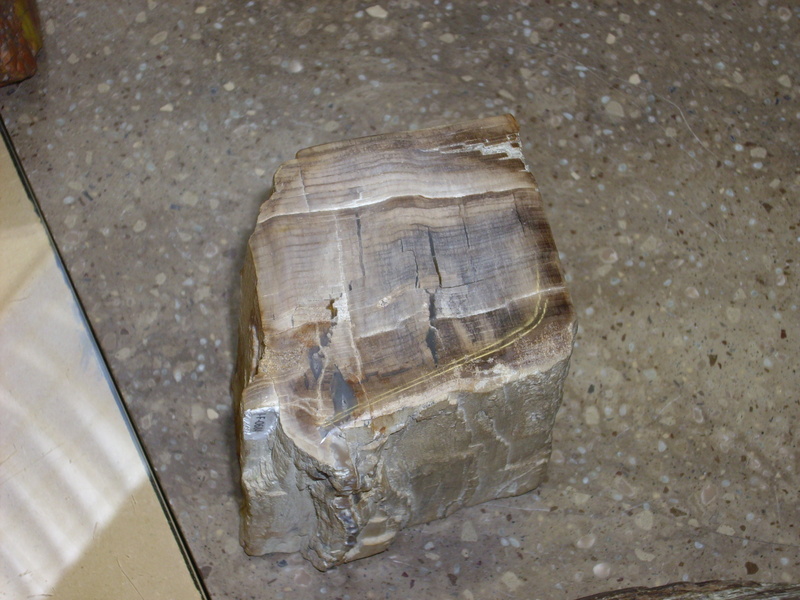 Back at the headquarters, I was allowed to make a close up photograph of a petrified wood sample. Notice how perfectly the rings in the original wood are preserved. 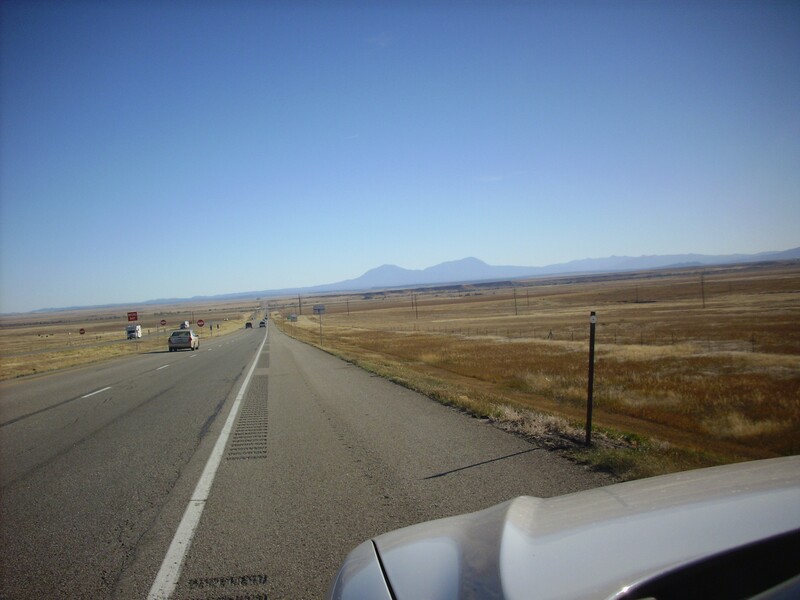 I returned to Route 24 and continued towards Colorado Springs. 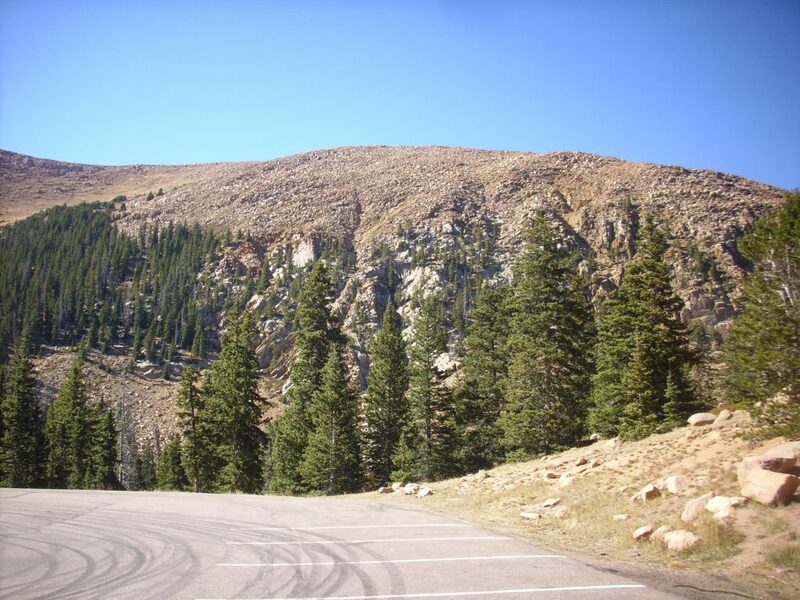 By this time I had decided that I would drive to the top of Pikes’ Peak as a short side trip. Well, it appears short on the map, anyway. I have a vague memory of doing this with my family when I was very young, but I hardly remembered what it was like and figured it would make for some outstanding photography. 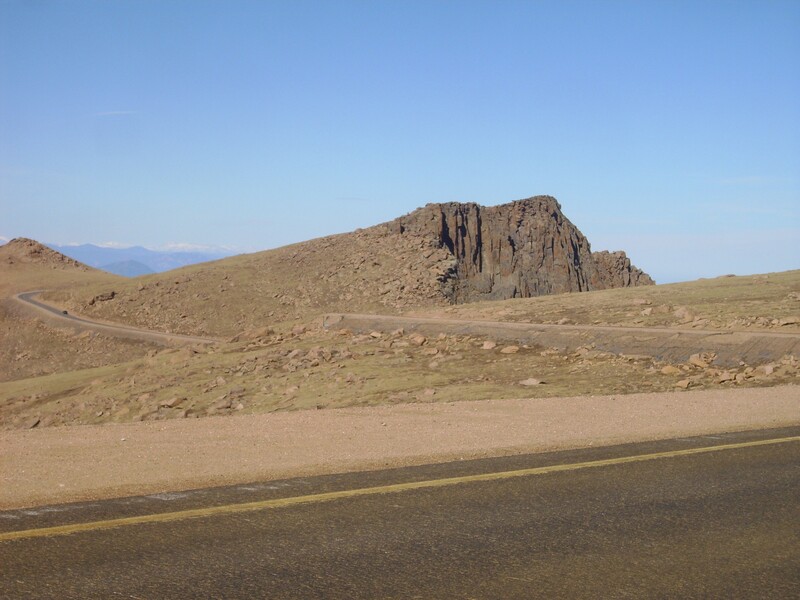 The further east I got, the more outcrops I saw of the Pike’s Peak batholith. 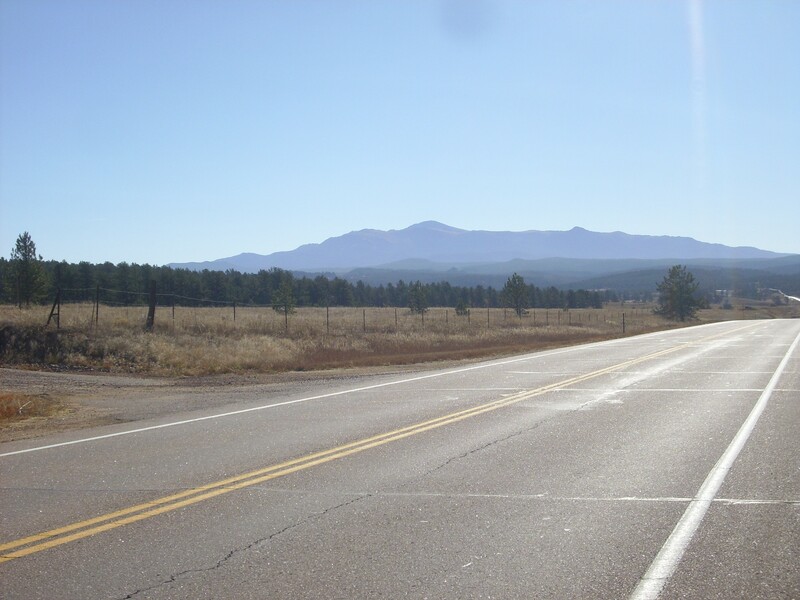 I arrived at the Pike’s Peak Highway turnoff in Cascade and exited. Turns out there is a very large Santa Claus-themed tourist trap; I ignored this. The highway to the top is, alas, a toll road, and when I pulled out my parks pass at the toll booth (there were Forest Service signs, so it was a natural mistake) I was cheerily informed that this was not a Parks Service area and $12 please. I coughed up. The drive was beautiful. 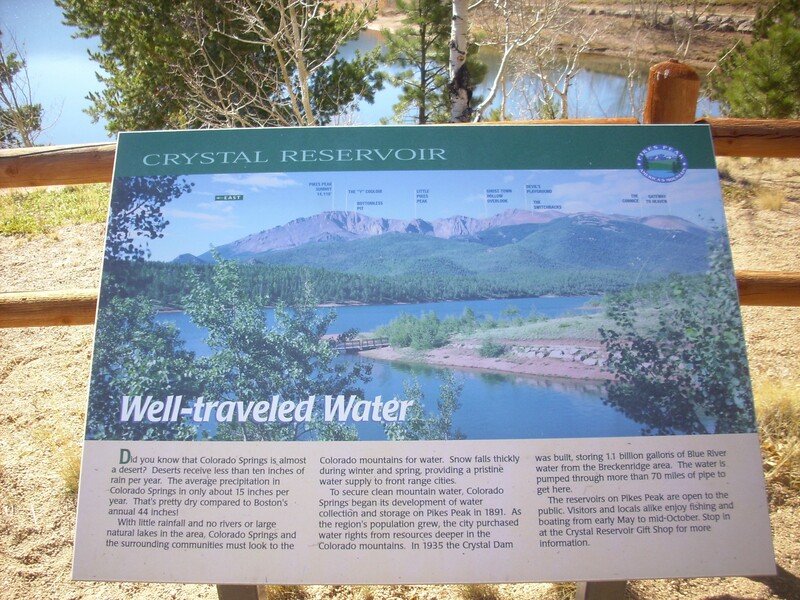 I paused at Crystal Reservoir for a few photographs. 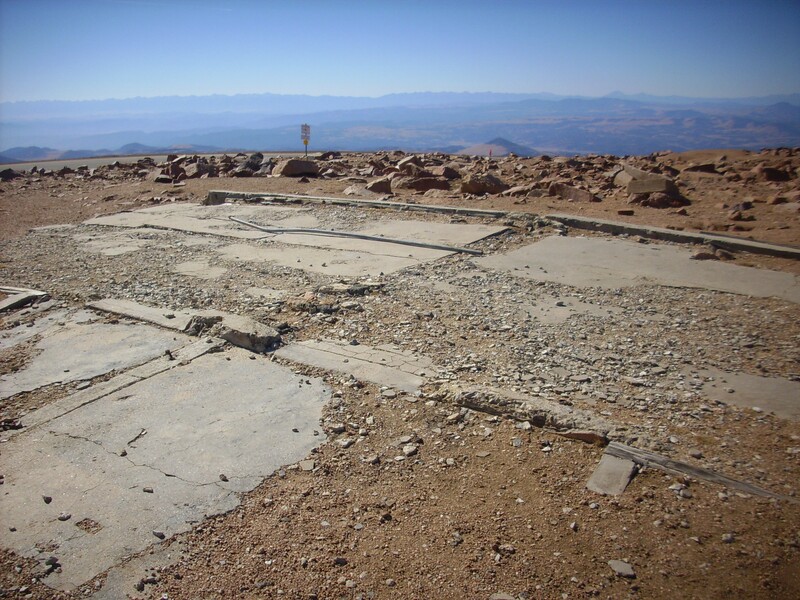 The summit of Pike’s Peak is at the center of the left frame. 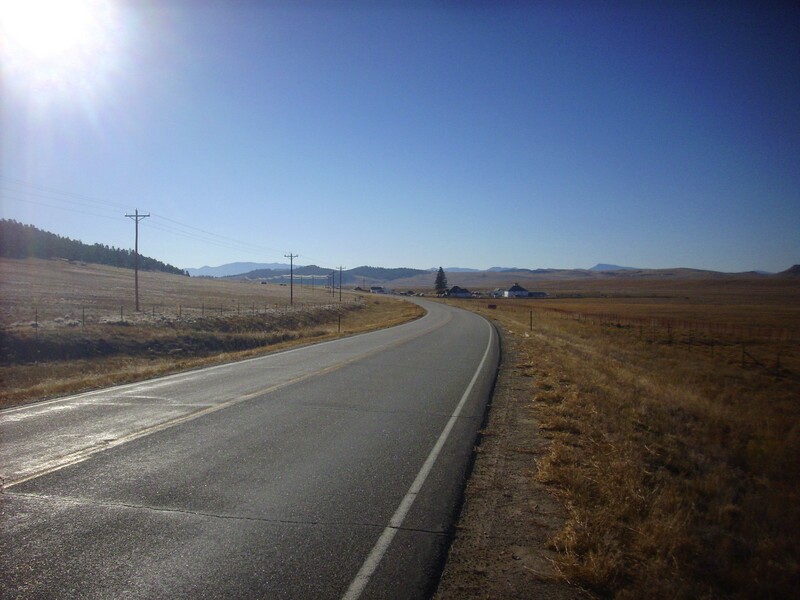 I continued up the road, which became increasingly steep, windy, and scenic. There is a sort of halfway point with another traffic control booth (closed this day, as the weather was excellent) and a parking lot and shop. 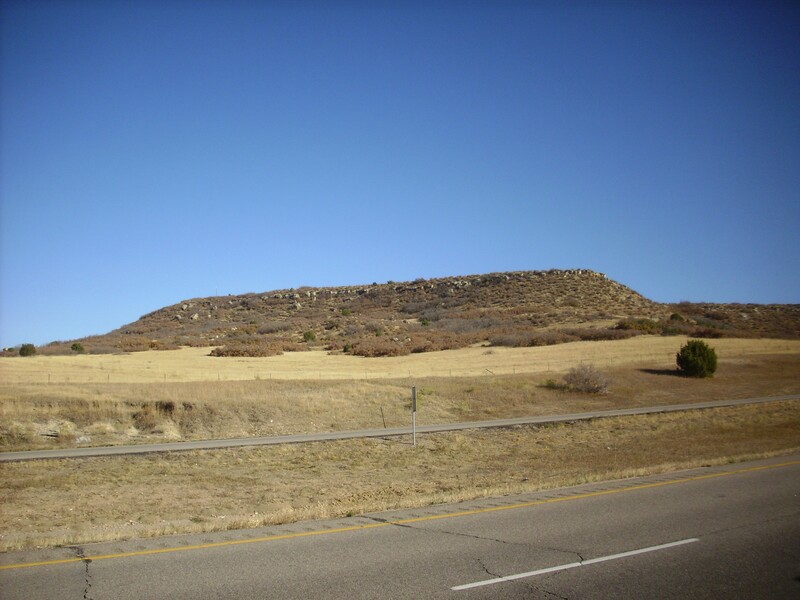 The entire area is underlain by the Pike’s Peak Batholith and its distinctive granite. 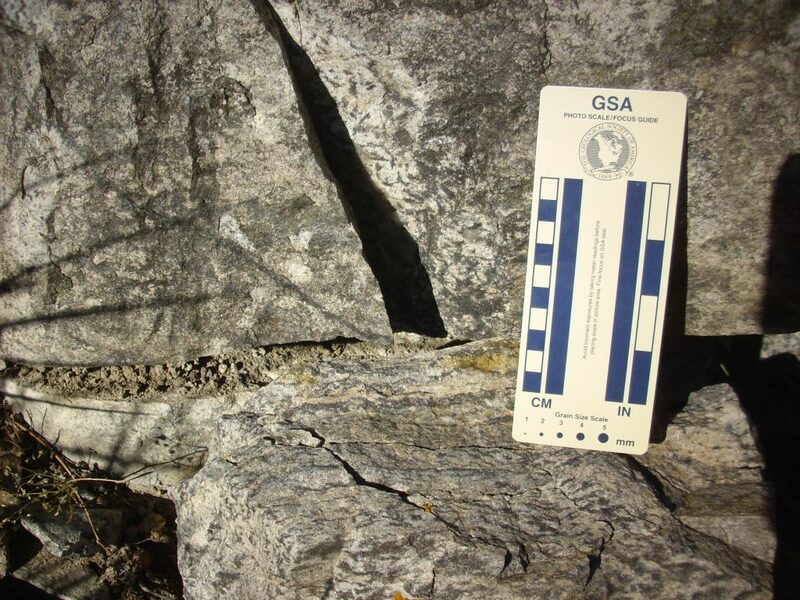 This photograph shows the typical rounded weathering of granite exposures. Didn’t record from where I took this one. 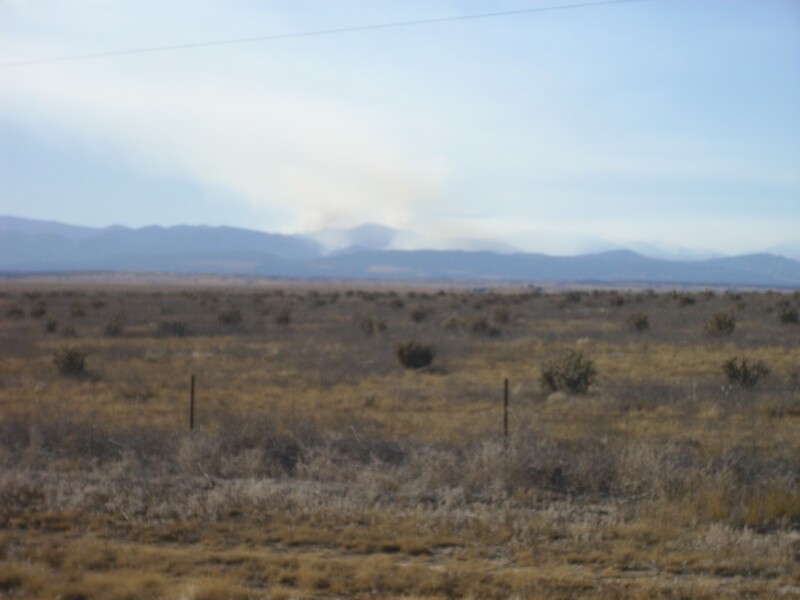 The smoke is from a fire to the south, in the Canon City area. 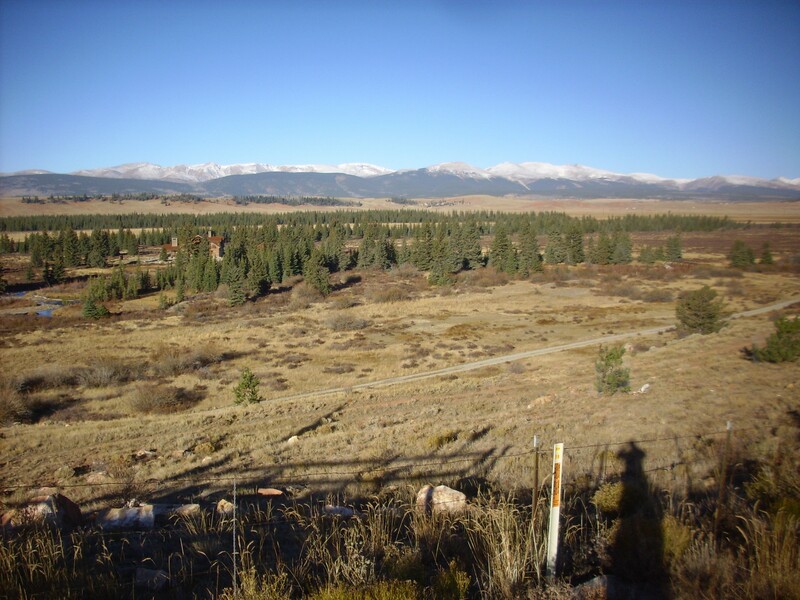 The jagged range on the skyline is the northern Sangre de Cristo range. I checked out the shop and restaurant briefly. There was nothing I could eat there and my stomach was still unhappy anyway. I thought about getting a “Keira Avenue” sign for my daughter, but she spells her name “Kira”. Found myself being stared at by a woman about my age; I have no idea who she was but the look was poisonous. Or else she was checking me out in a cougarish kind of way. 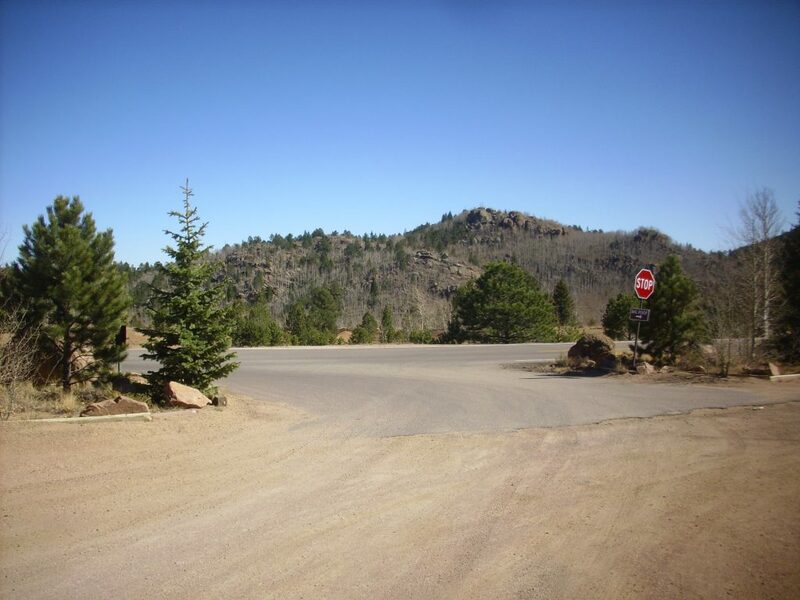 The summit area is so broad that it’s hard to identify one point as being the summit. 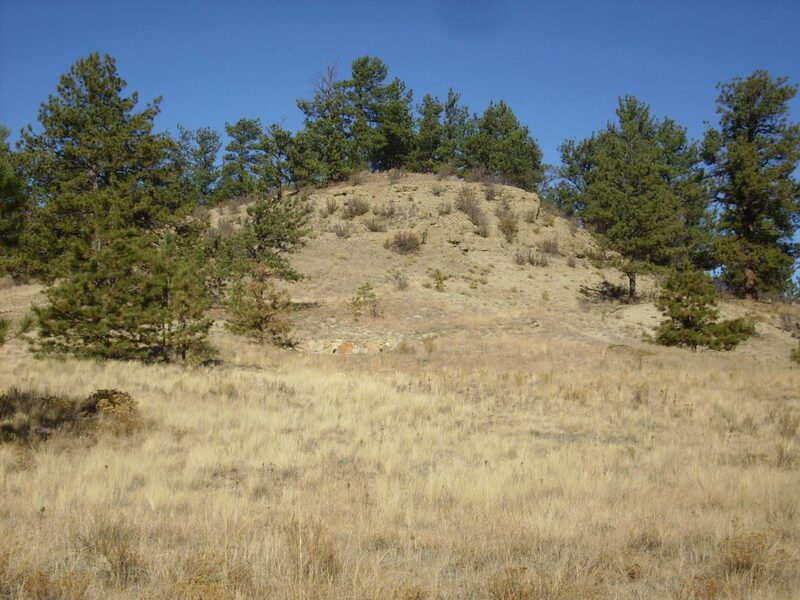 My GPS did not record the altitude anywhere here as greater than 13900′; the peak is supposed to be around 14115′. Not sure the GPS is accurate at that high an altitude, though its lateral position remained accurate. But this point looked about as high as anywhere and seems to have once had a building of some kind. Unless the actual peak was in a nearby rubble field. Some large white crystals to give variety, but otherwise not a particularly pretty granite. Might’ve been prettier on a fresh surface, but I felt a certain hesitation about cracking rocks here in the middle of a big tourist site. The drive back down was slightly nightmarish. Large signs insisted you should use lowest gear to avoid burning out your brakes. Well, my lowest gear maxed out at a speed of about 20 mph, and time was passing. Next gear topped out at about 45 mph, which was recklessly fast fpr this road. Fortunately, I had had my rear brakes replaced just before the trip, along with my tires, at Cindy’s insistence. Glad I listened to her. This was worth a stop. So I pulled over. Turns out it’s called the Bottomless Pit. Drove the rest of the way down in low gear. Did not burn out my brakes. Now to see if I could remember how to get to my sister’s house. I had a vague recollection I should go north and exit at Academy, but then I was unsure where to go next. The problem is that all the cross streets I hit looked familiar. I finally stopped for gas and directions. Say, you have a phone book? Nah, we threw it away. *Blink blink* There was a bus stop nearby; I looked at the map. Unfortunately, it labeled only major streets, and Descanso Circle isn’t one. Ah, forget it. It was already mid-afternoon and I still had a long drive ahead. I’ll have to visit Susan some other time. The drive was not quite uneventful. Just north of Walsenberg, I had a pretty good scare. Some *deleted* was slowly pulling past a truck, and I found myself behind him. Then he must have decided he was not going to get around the truck in time for his exit, and he slammed on his brakes to pull back and get in the right lane. I was caught off-guard, slammed on my own brakes, and found myself weaving all over the road trying to keep control of my vehicle. Glad Cindy had me get new tires and brakes before this trip. Idjit. I hate it when other drivers do stuff that scares the snow out of me. Further south, the geology started getting interesting. This road cut was striking enough for me to stop and examine. I looked it over, and finally spotted some fossils. My very own Cretaceous oyster. 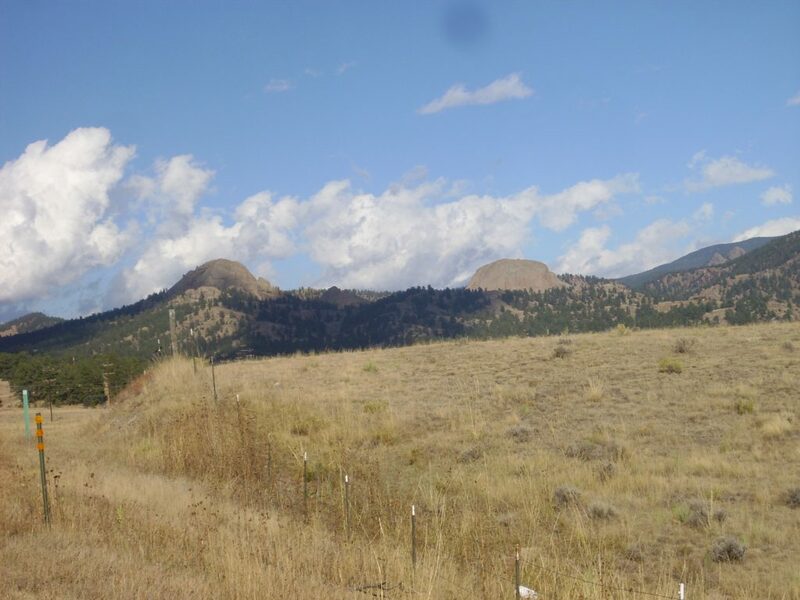 I was not sure, but suspected the formation capping nearby hills was a different formation. 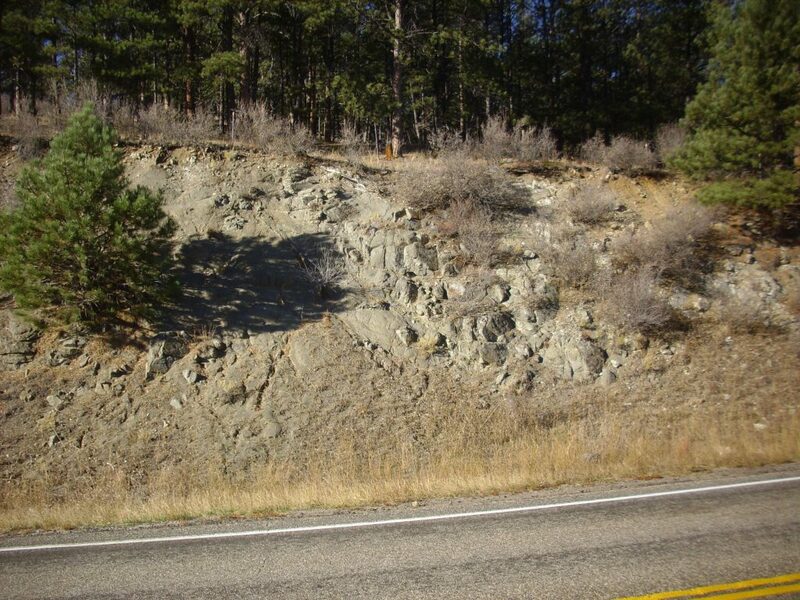 After I got home, I scrutinized the geological map and found that the road outcrop was Greenhorn Limestone, which did not surprise me, but that the beds capping the hill probably were as well, which did surprise me. 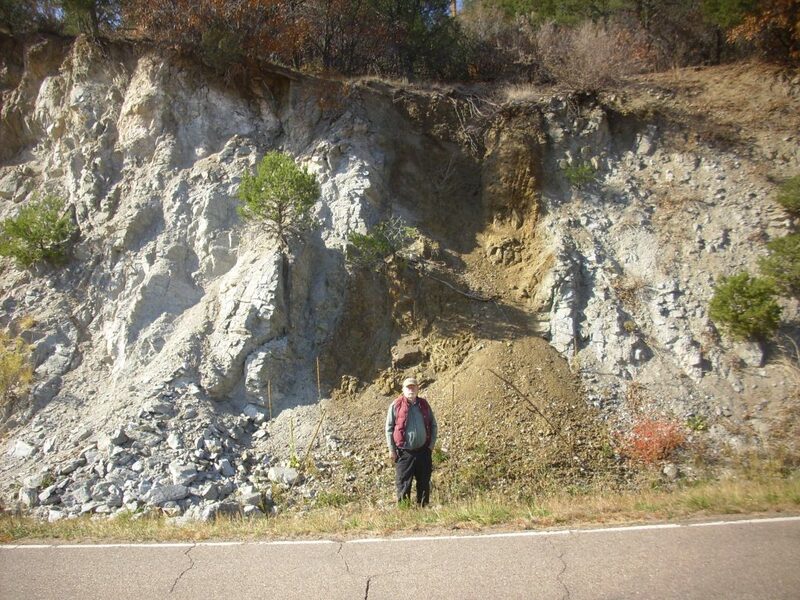 Lots of faulting in this area, though. Ahead the Spanish Peaks stood out. While I’m not impressed with the concept, I’m impressed with the scale. The hubs are about the size of a boxcar. 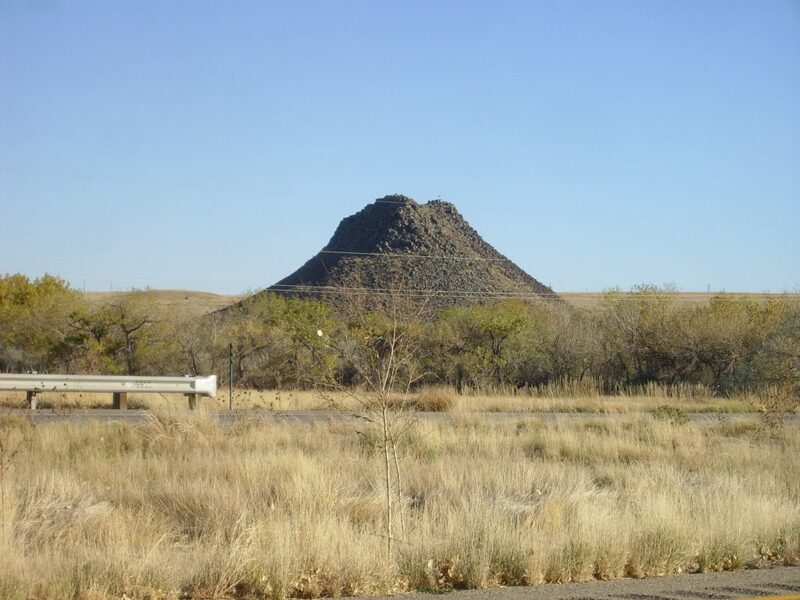 Your local neighborhood cinder cone. We’re approaching the Raton volcanic field, and I’m guessing this is a far northern outlier. Or else the ants have mutated again. Looking ahead to the mesas over Trinidad. 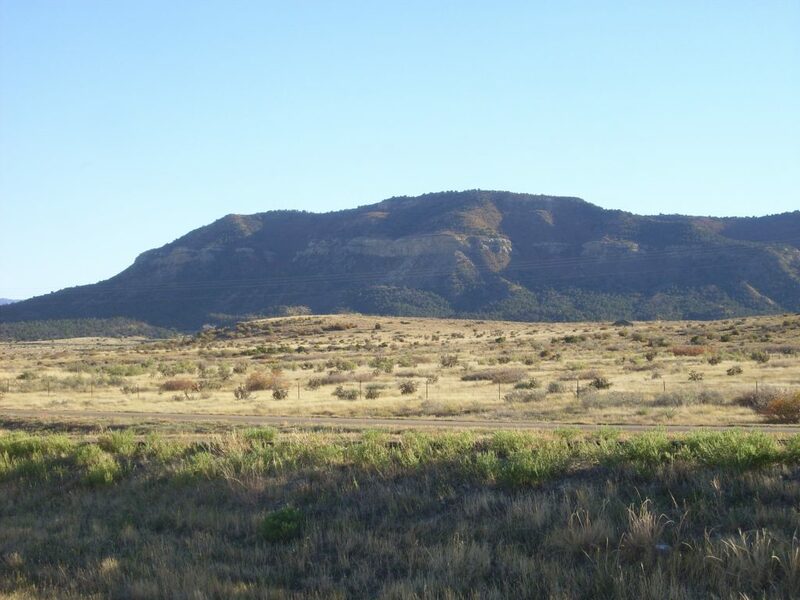 The mesas are topped by basalt flows of the Raton volcanic field. The cliffs here have a distinctive formation halfway up their faces. This went on for miles. 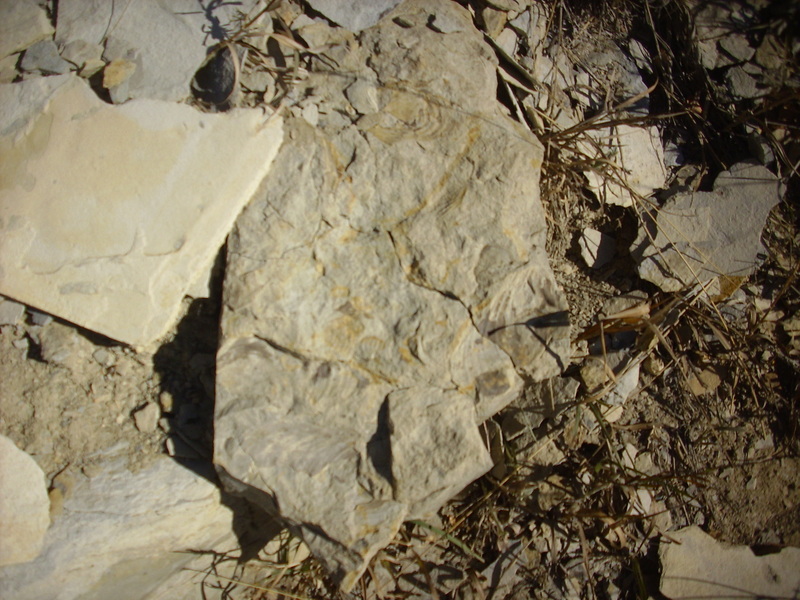 I guessed this was the Trinidad Sandstone; after I got home, I checked the geologic map and confirmed it. 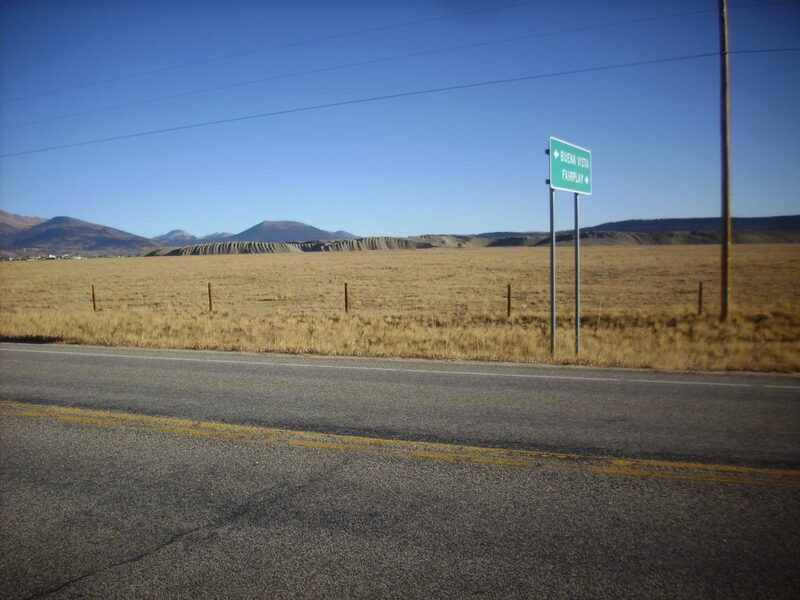 Through Trinidad and into Raton Pass. One last photograph before the sun set. I think we’re seeing Raton Formation over shale of the Vermejo Formation, separated by a thin bed of coal at the boundary. From here I was in country Bruce and I visited last summer, and I was not inclined to rephotograph it. The sun set and the night settled in as I drove the last few hours home. 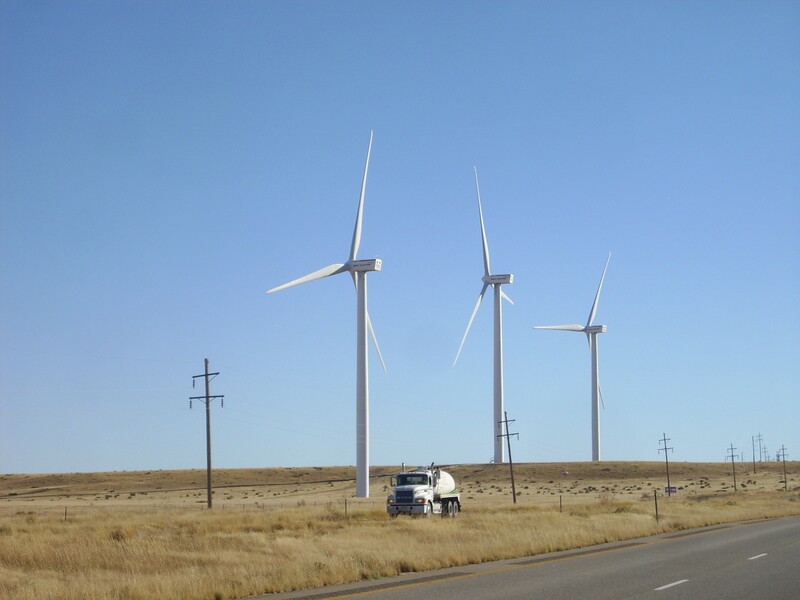 But I was in for one last treat: As I drove north out of Santa Fe, a quite bright green fireball descended to the northwest and broke into yellowish fragments. Got home. Discovered that my daughter had been in the emergency room for intractable abdominal pain. Arrived, in fact, at the same time as my brother-in-law, who were there to help give Kira a blessing (a Mormon practice for the sick) in my absence. I arrived just in time to participate. 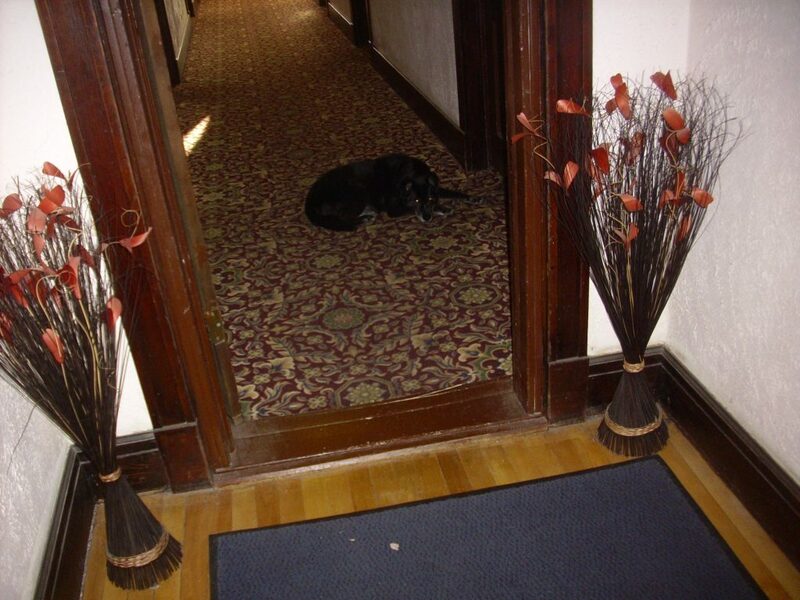 Cindy wanted a blessing, too, since she has had some problems with a superficial blood clot in her leg. While I was sorry to miss finding Susan’s house in Colorado Springs, had I succeeded, I would have come home too late for this. Kira had some kind of -oscopy today that established that it is interstitial cystitis. This is a common comorbidity with fibromyalgia, which my daughter has had since she was 14. Sigh. At least we have a diagnosis and some guidance for treatment. Also discovered that a step was broken on my back deck. The whole deck is in poor shape, from a bad decision to put potted vegetables out there (the fertilizer in the pots leaked on the deck and promoted rotting) and from poor choices of deck paint. I replaced the broken step today and will have some friends help me strip and repaint the entire deck in a couple of weeks. I also caulked the gutters on my eaves for the winter. 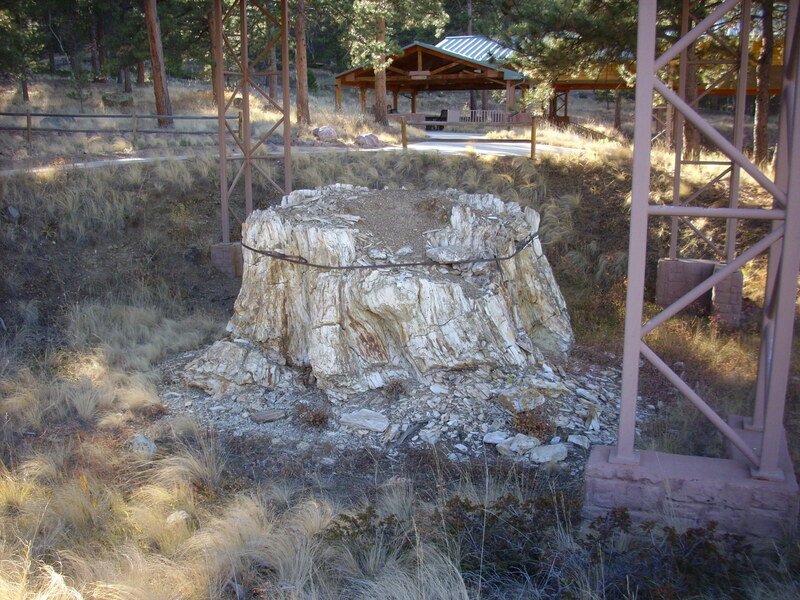 Tomorrow I will be off with the Los Alamos Geologic Society to see the Nacimiento mine in the northwest Jemez. 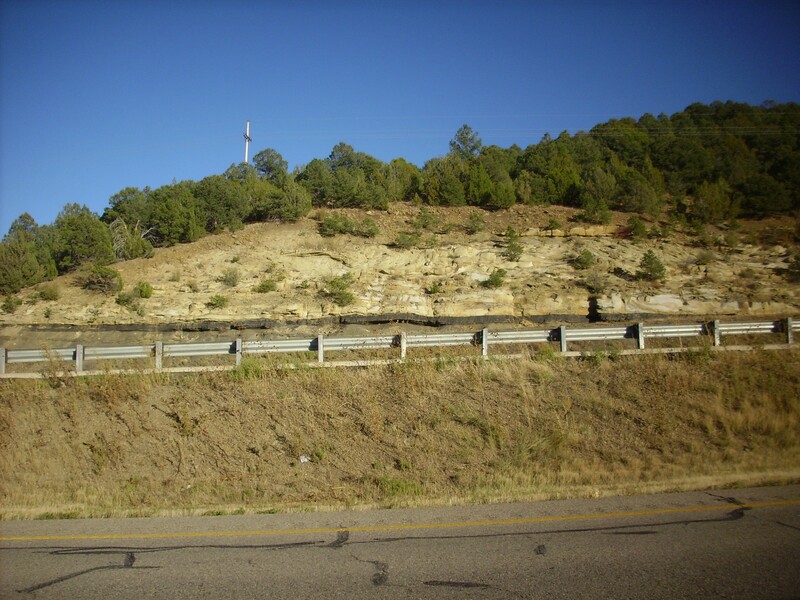 This is the part of the Jemez I have seen the least of, both because it’s the corner opposite my own and because, for some reason, there are very few published road logs for the area. Hopefully I’ll come back with some good photographs and some good specimens of copper minerals. That’s all right. I couldn’t have gotten more specific than “mollusc” on my own.